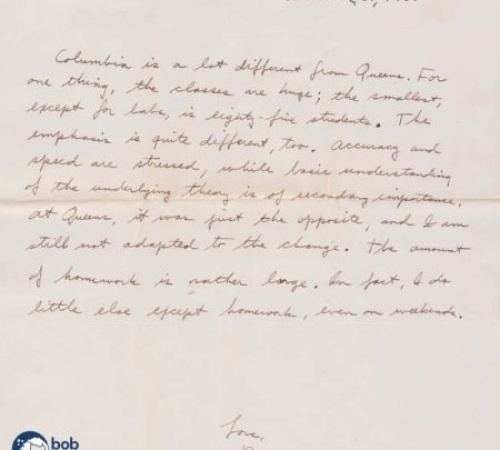 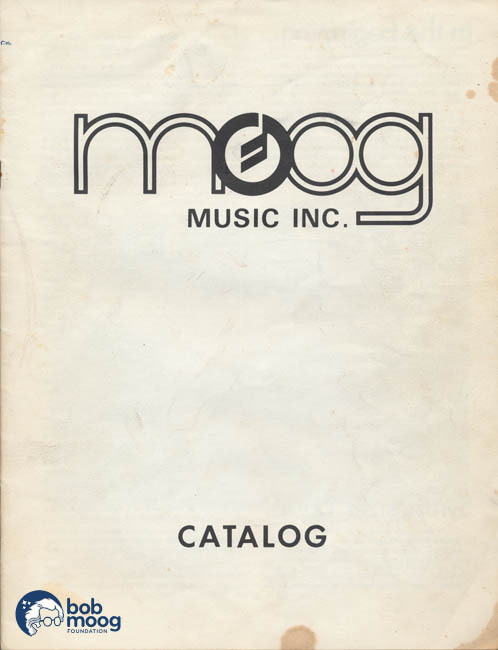 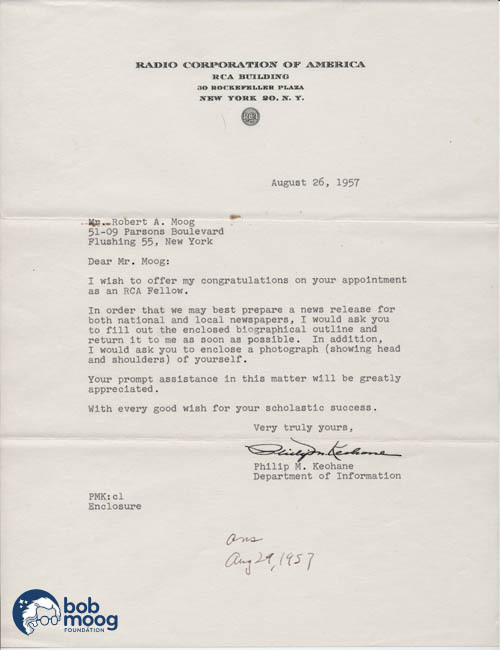 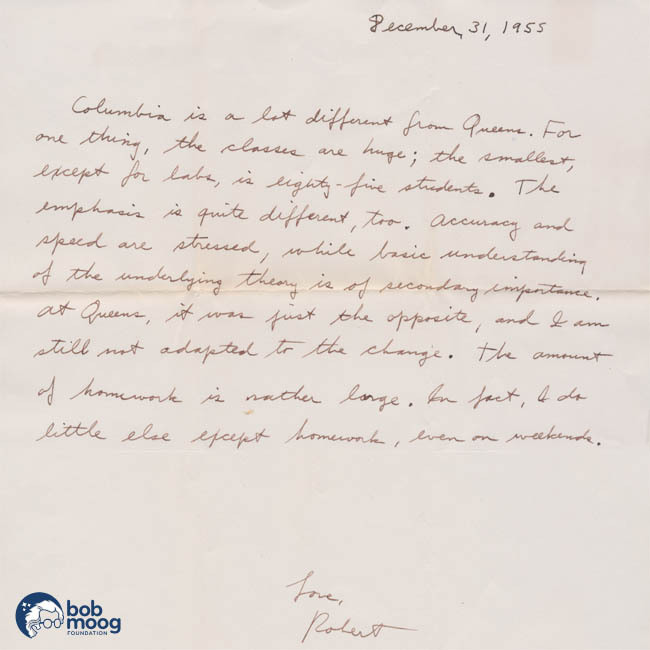 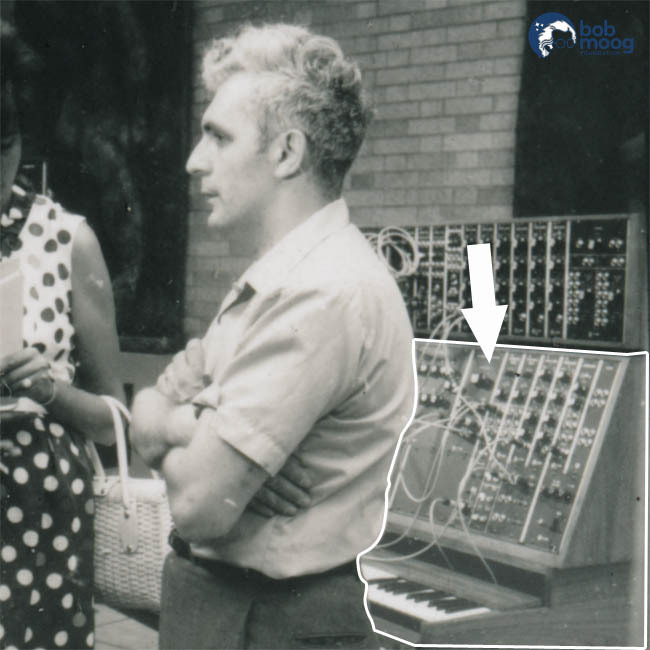 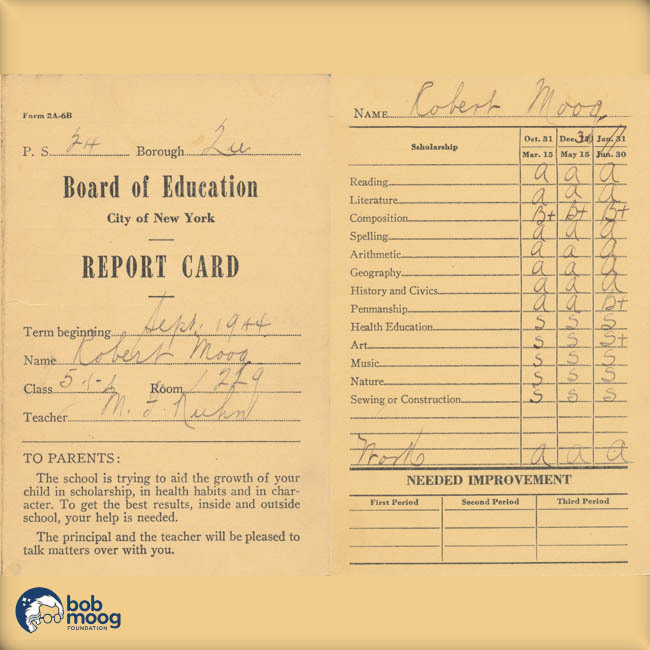 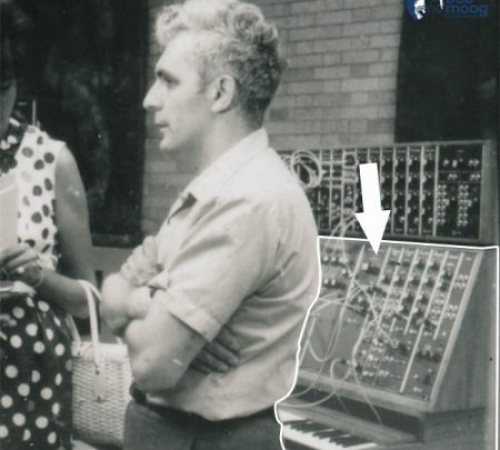 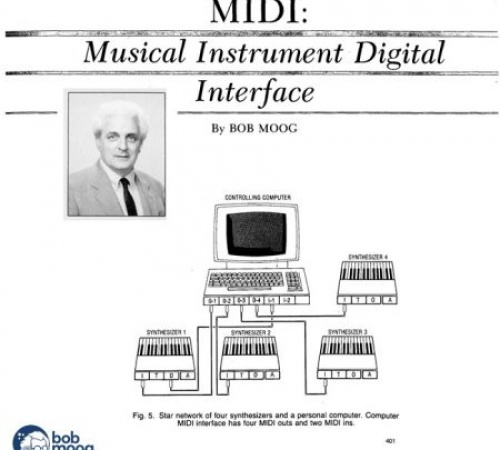 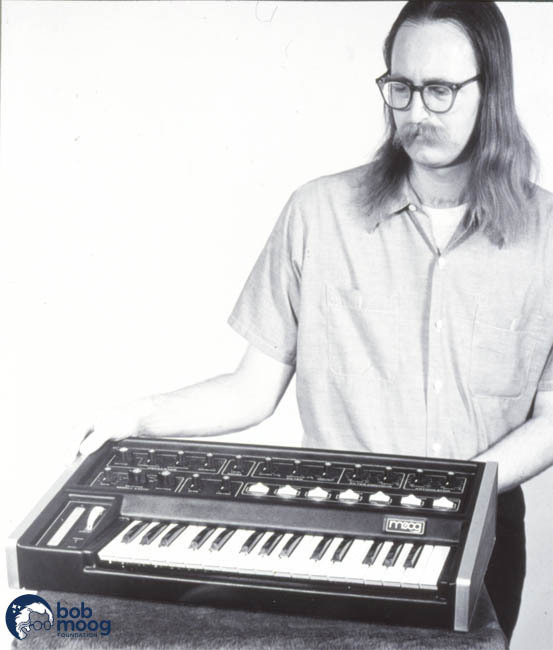 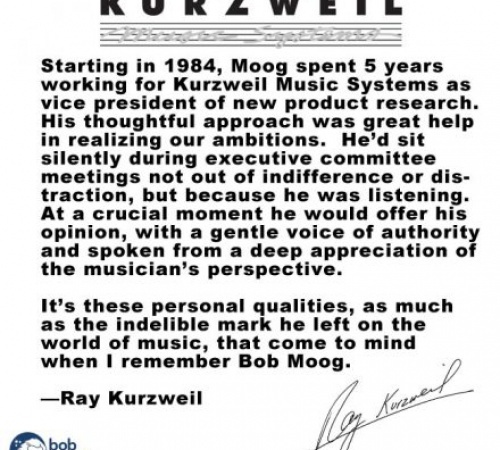 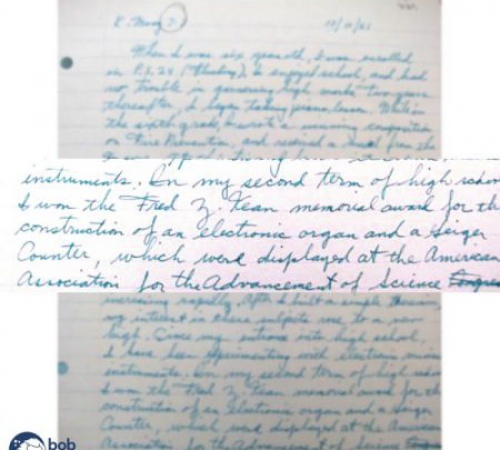 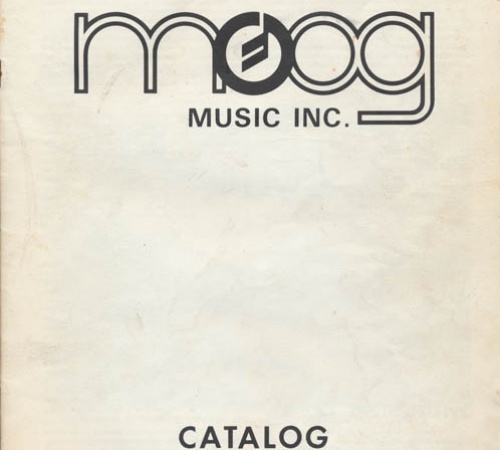 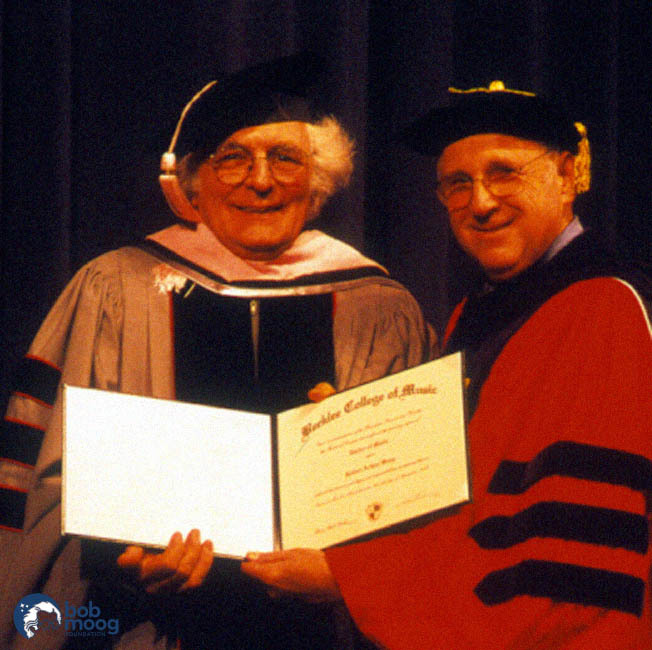 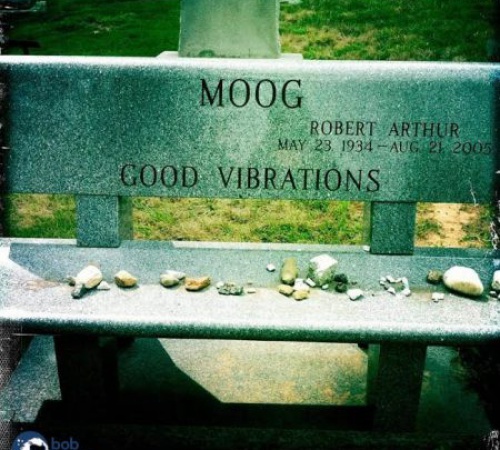 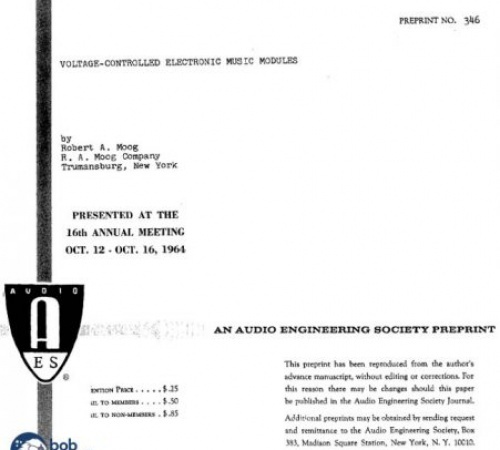 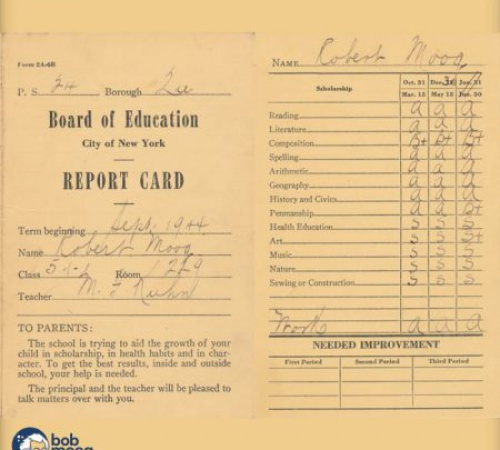 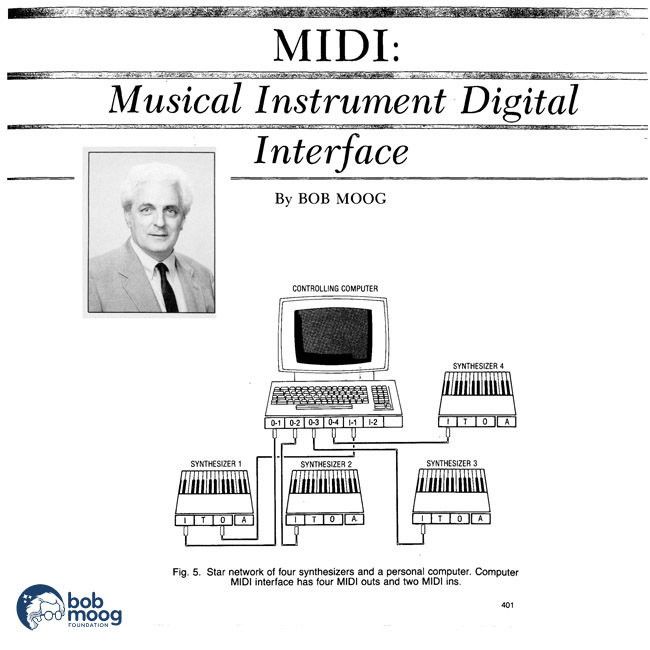 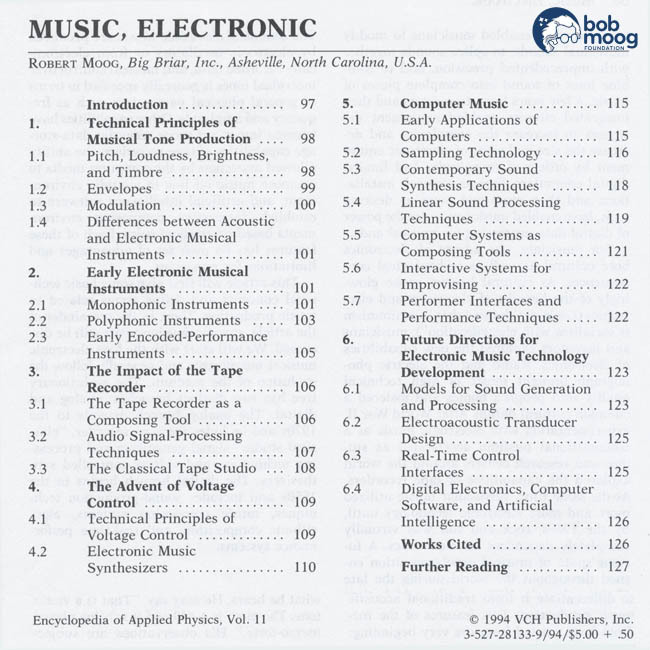 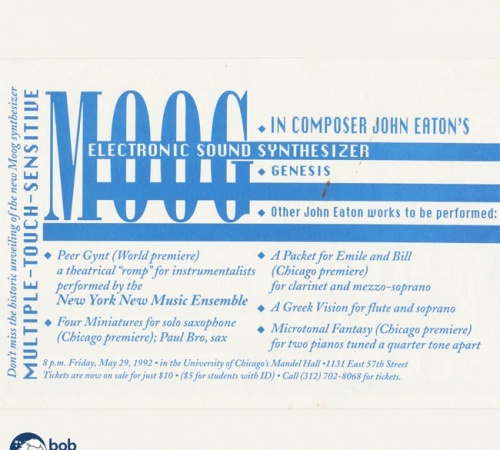 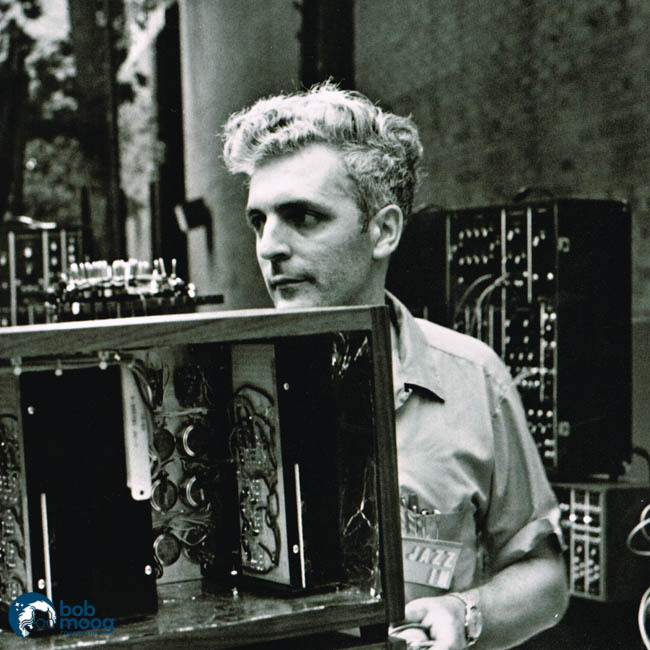 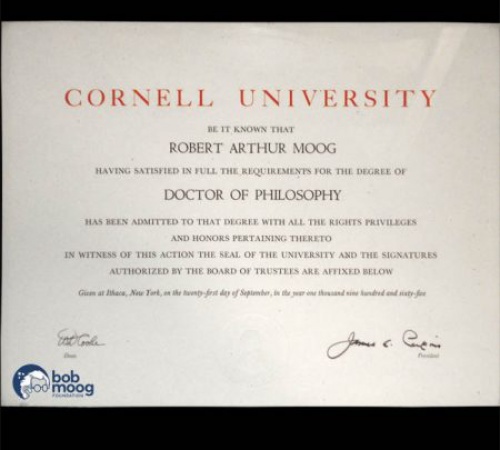 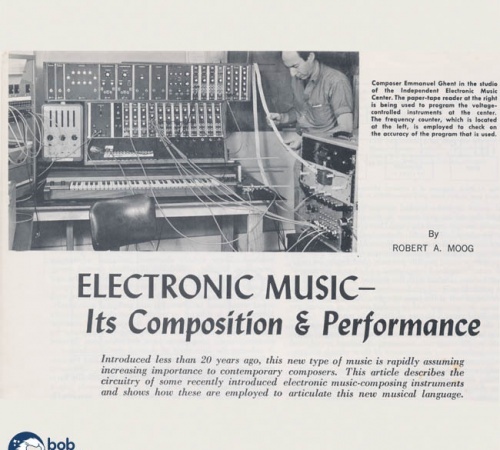 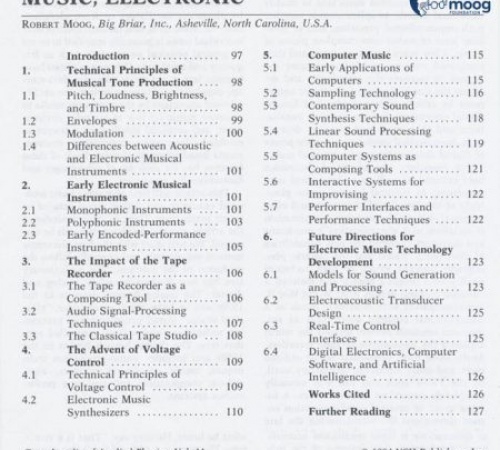 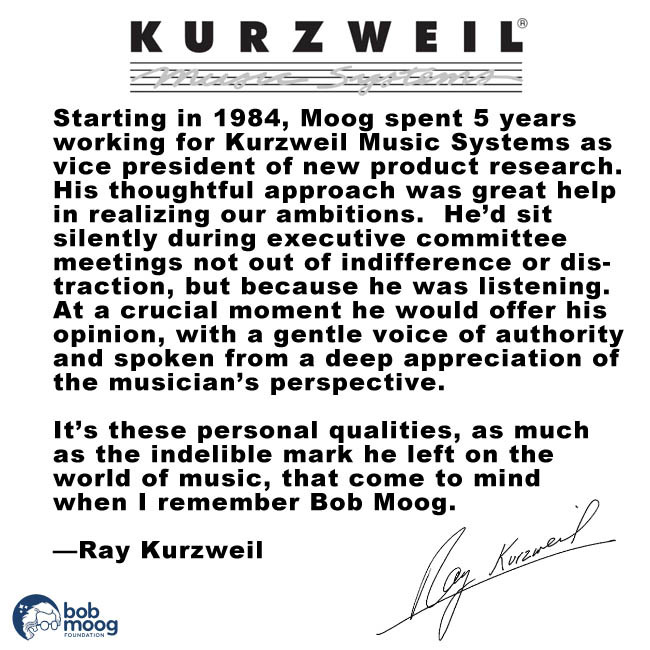 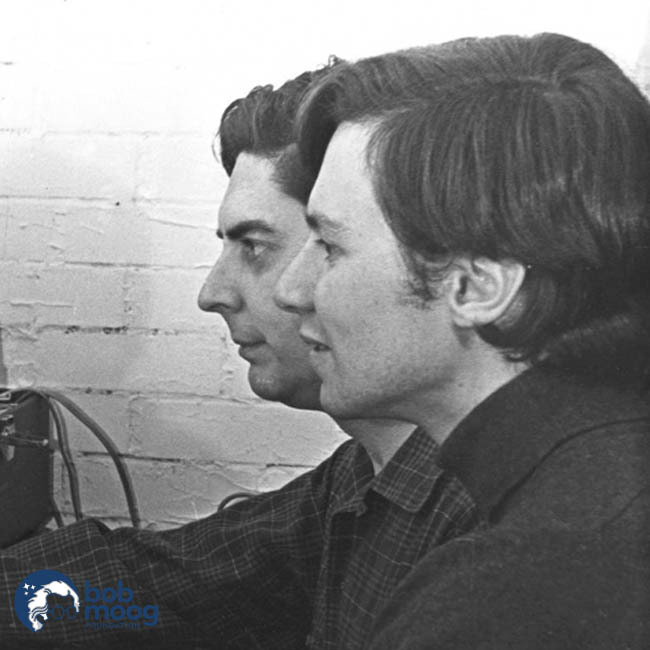 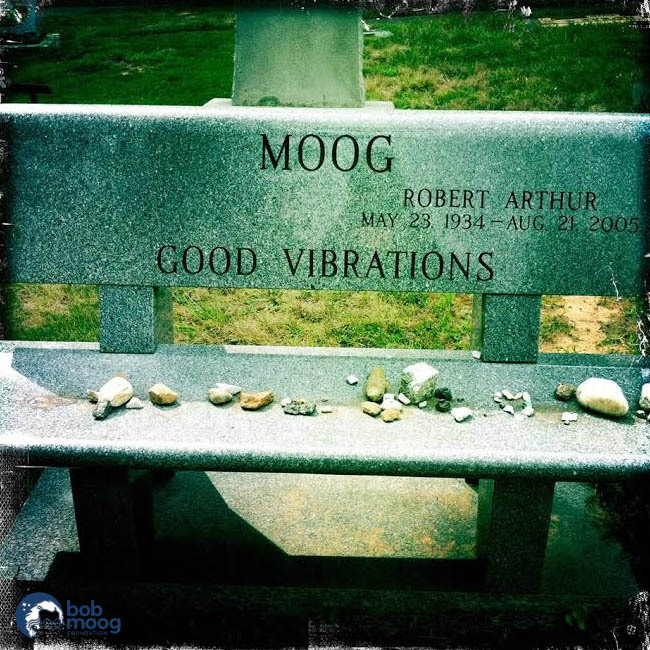 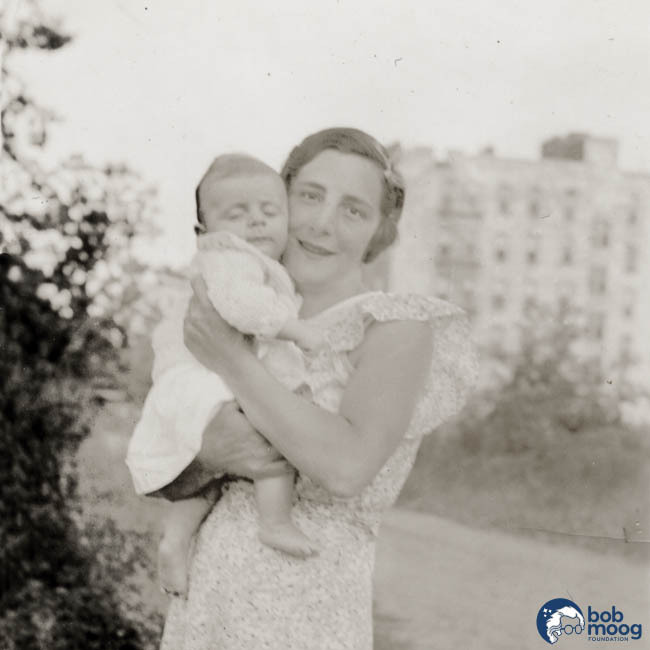 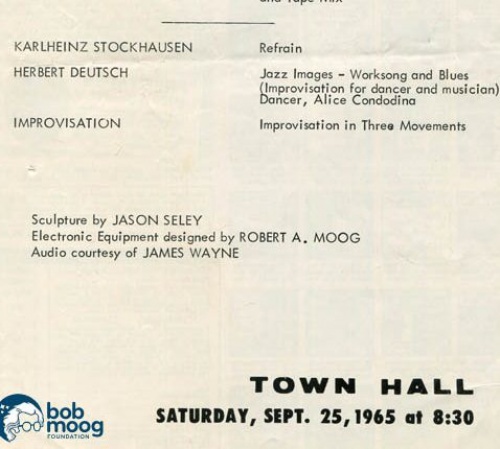 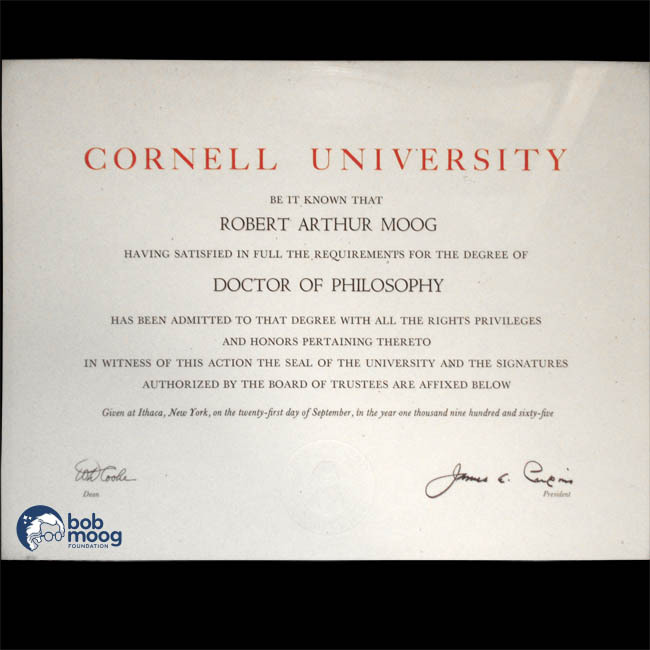 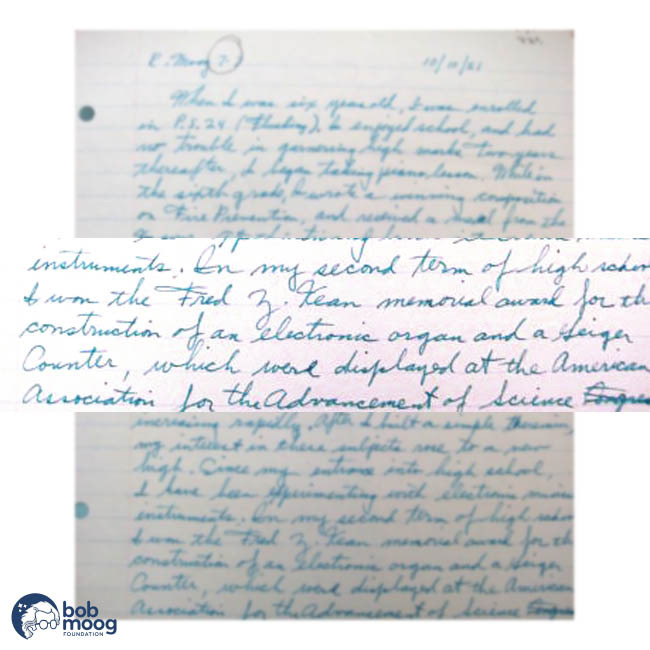 at info@moogfoundation.org.To get the most out of our timeline, please explore the “Read More” tabs, which will take you to additional assets, including full articles, pages from Bob’s desktop notebooks, schematics, and other archival materials. 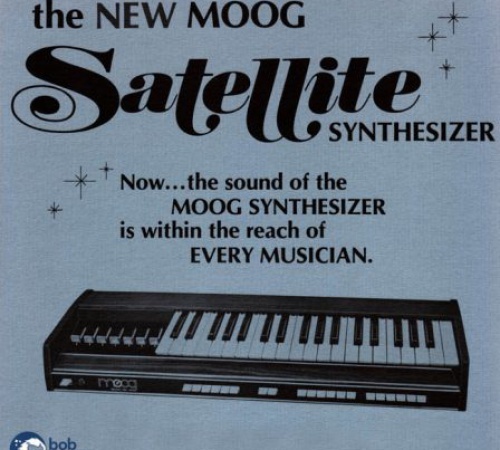 All of the images are expandable. 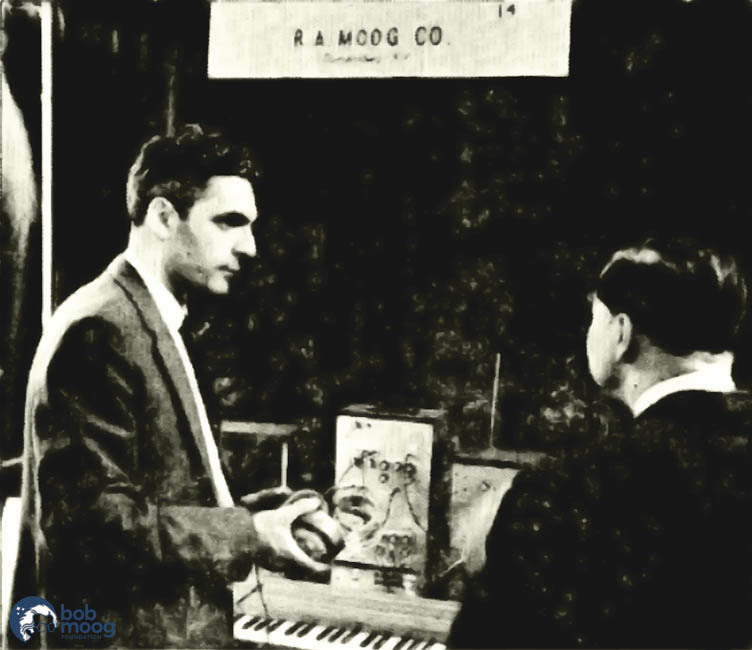 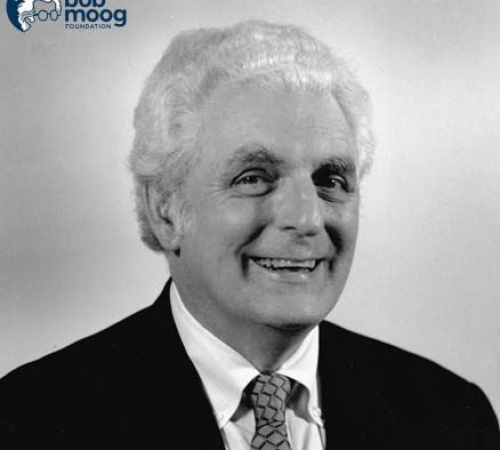 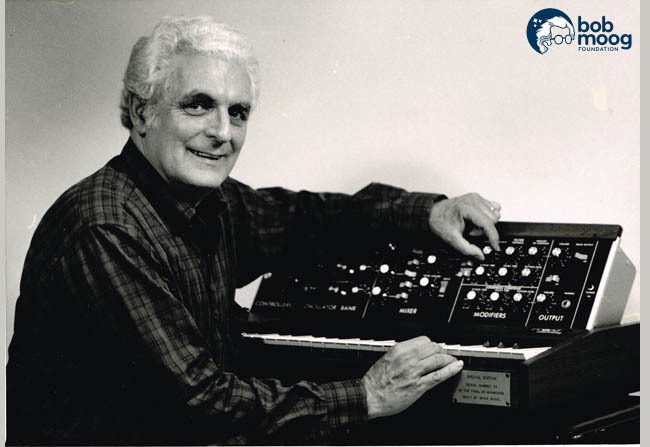 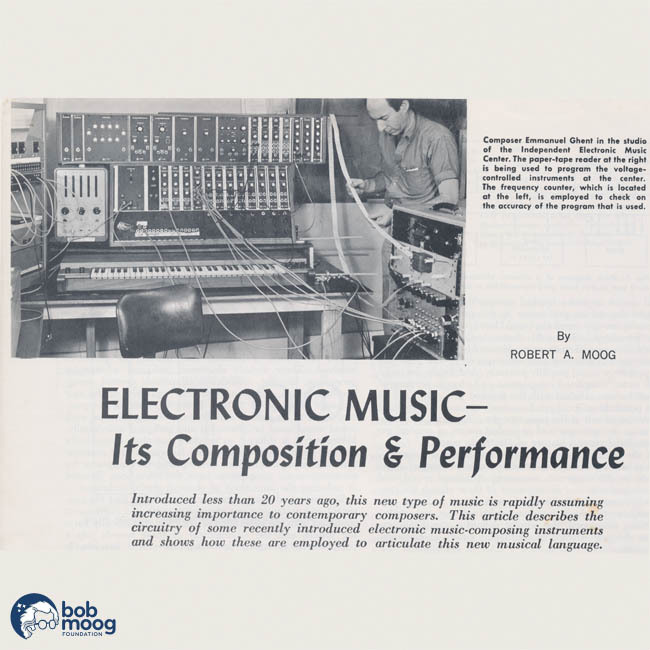 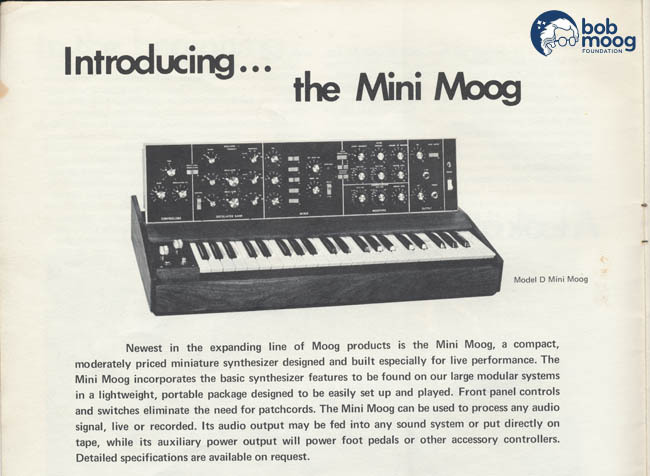 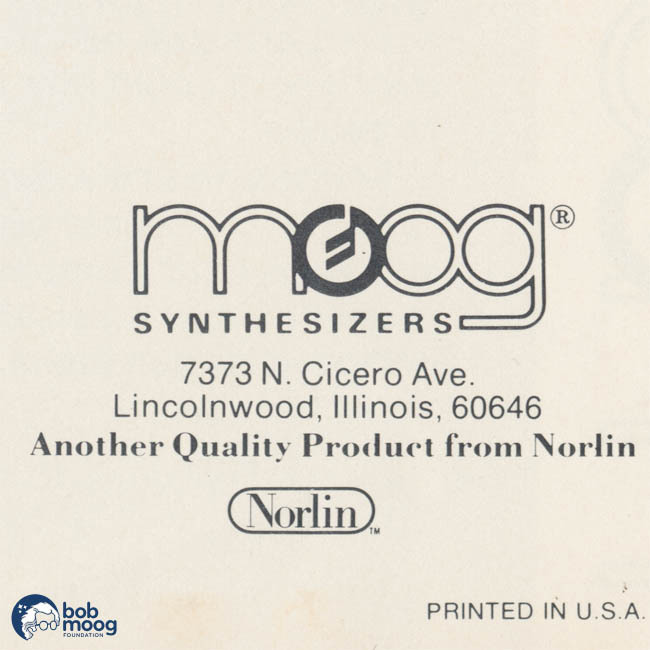 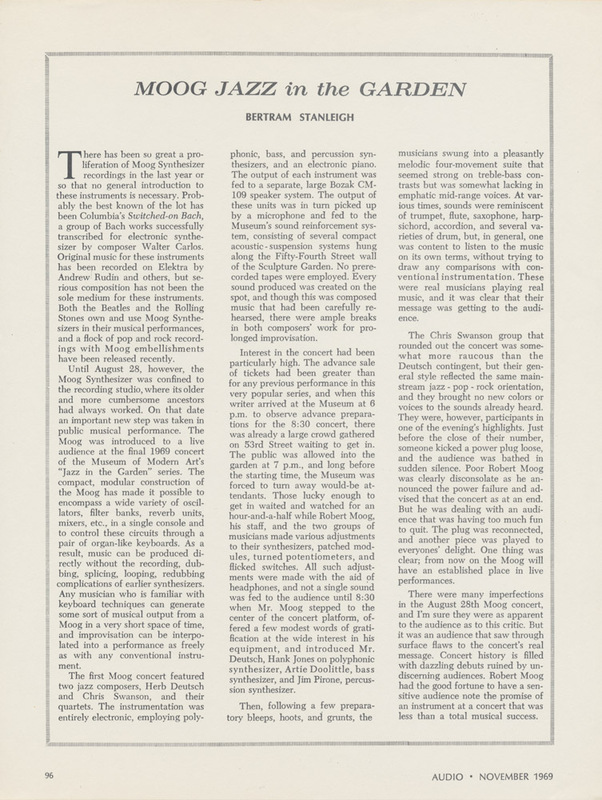 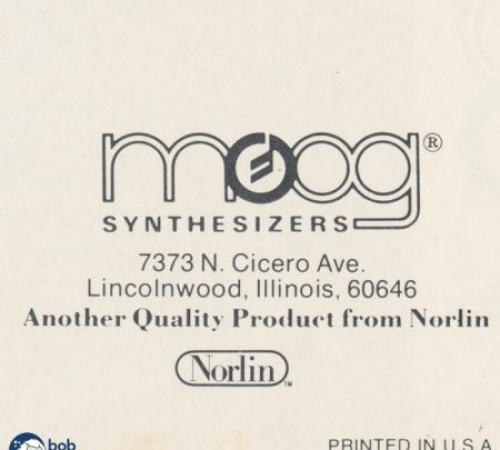 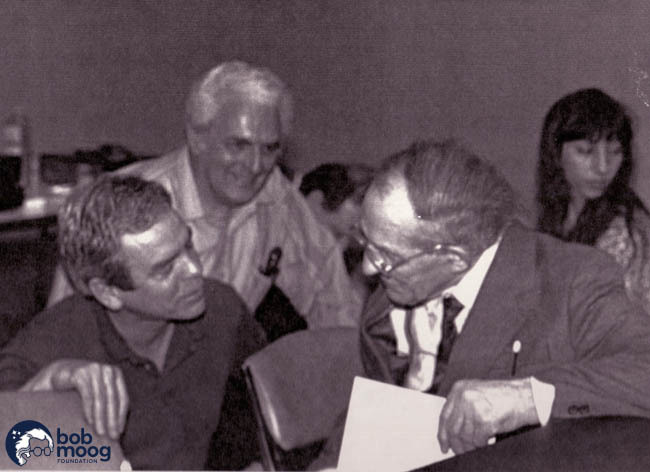 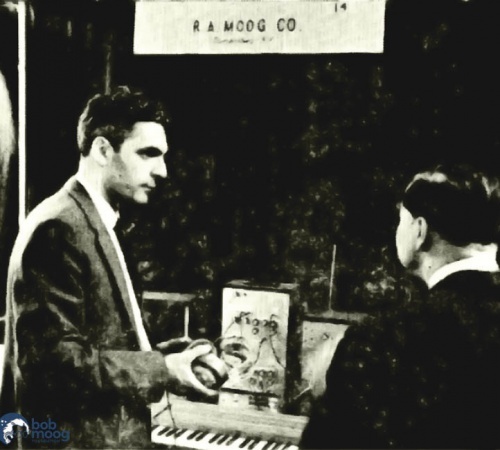 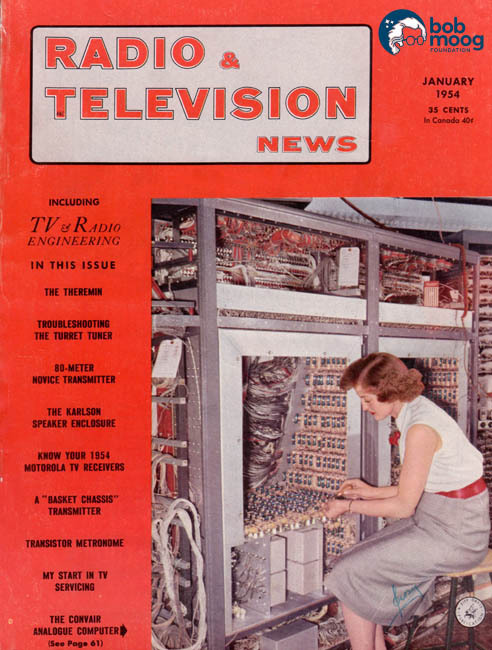 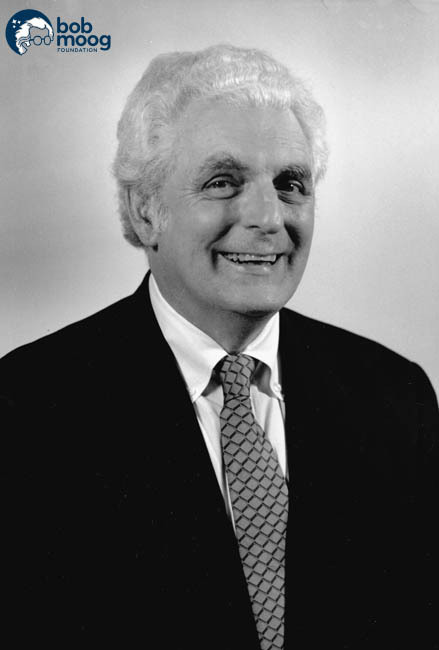 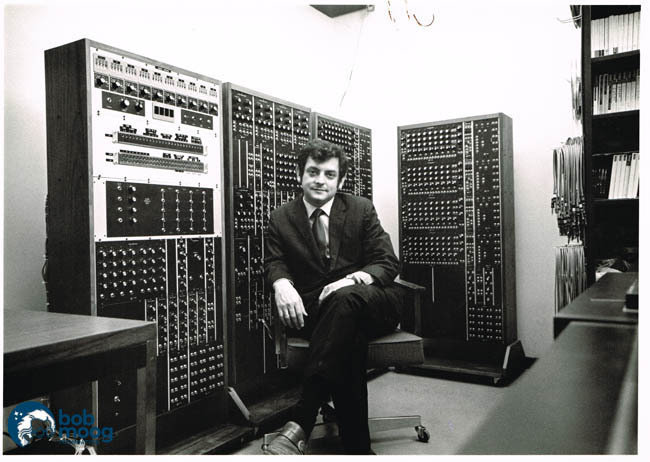 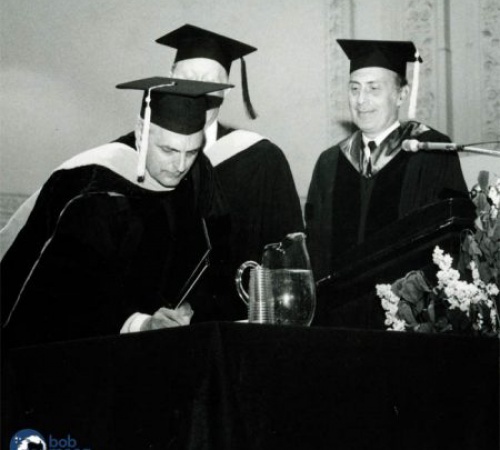 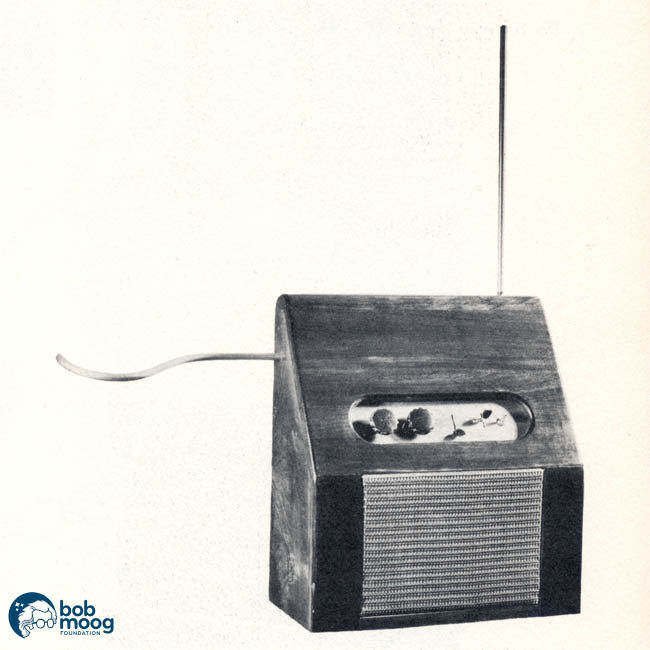 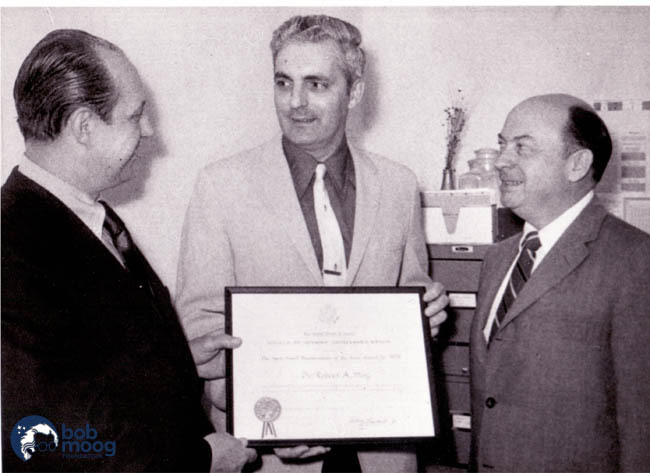 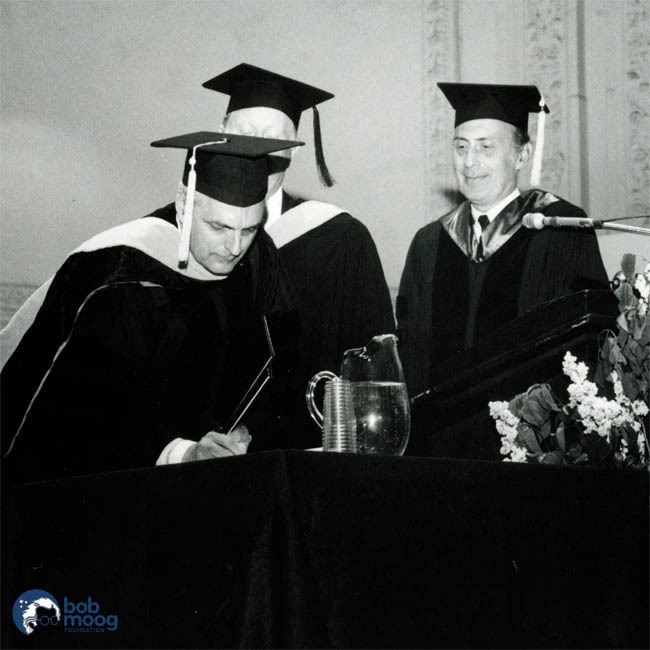 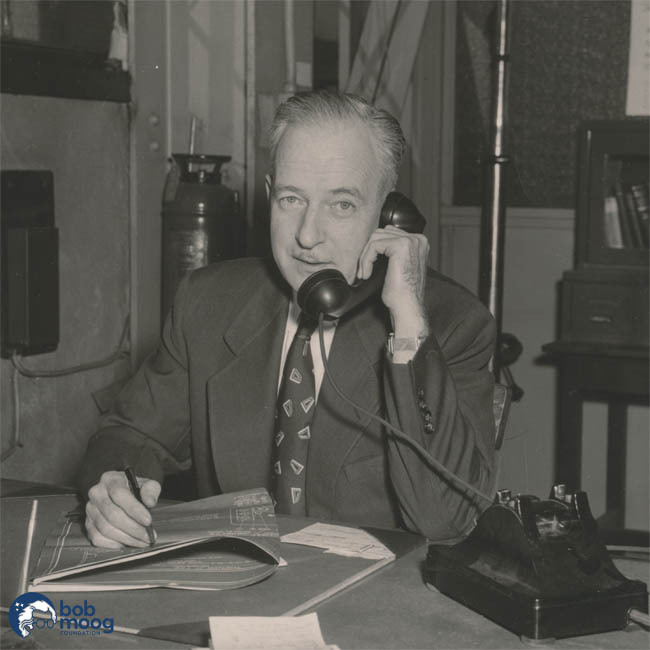 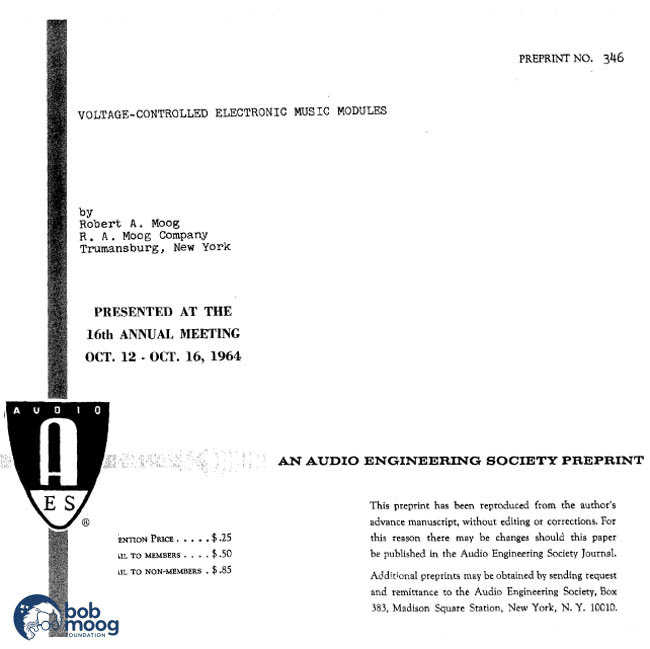 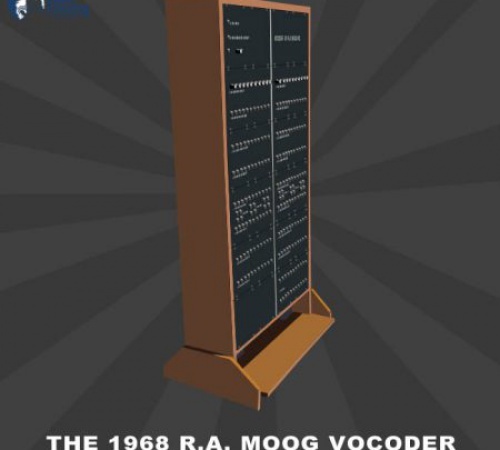 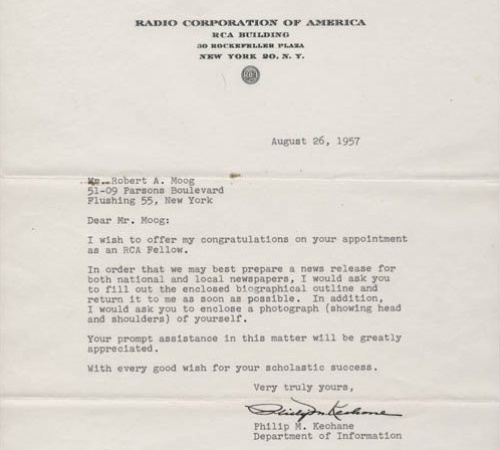 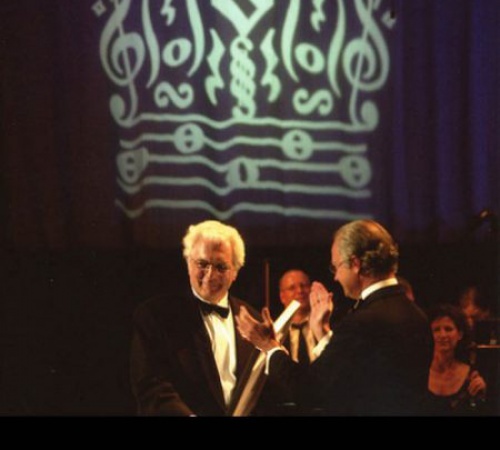 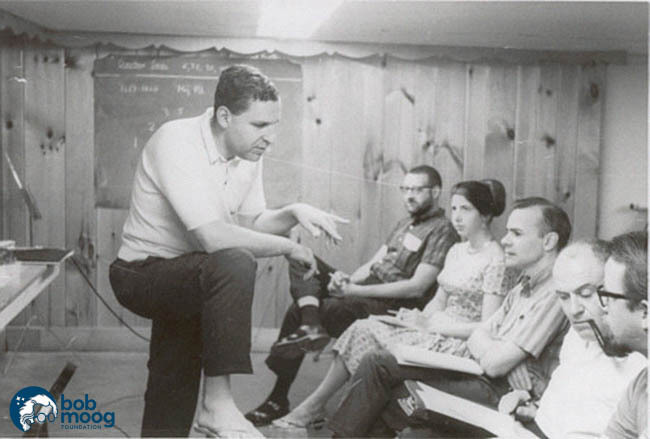 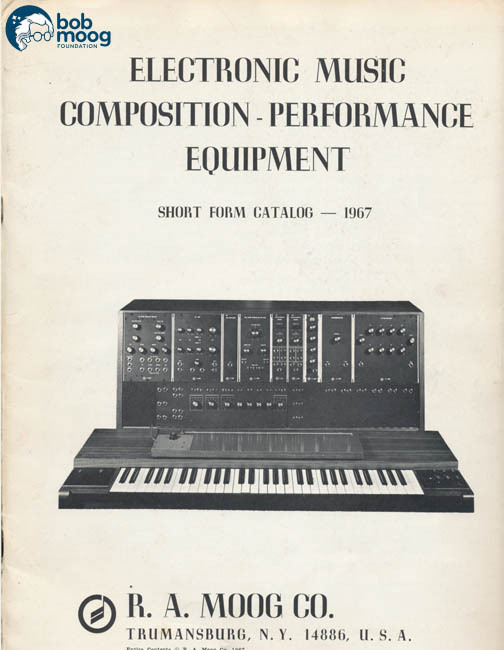 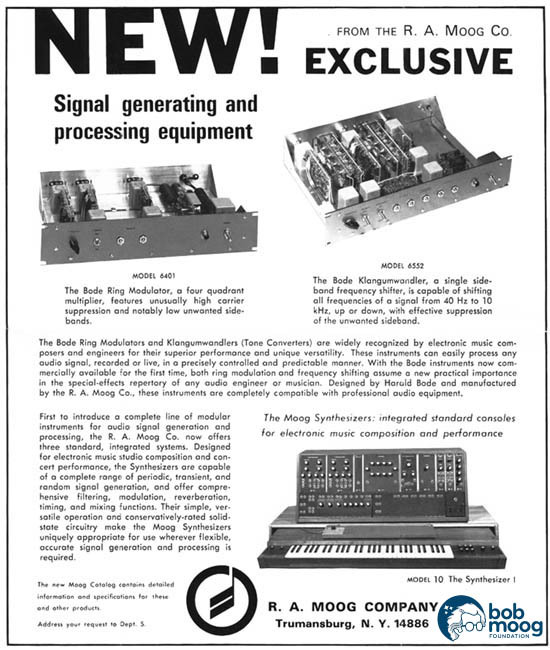 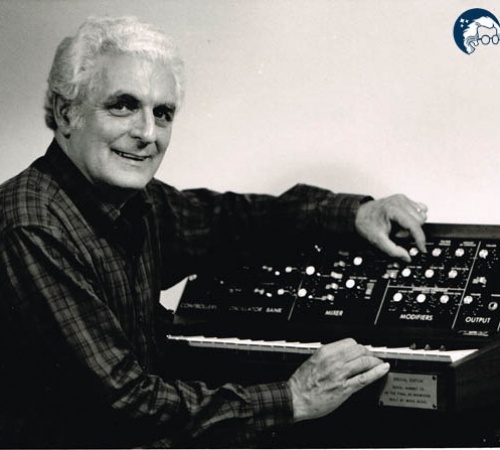 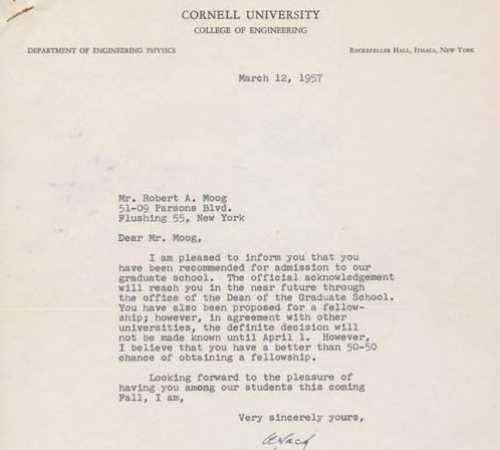 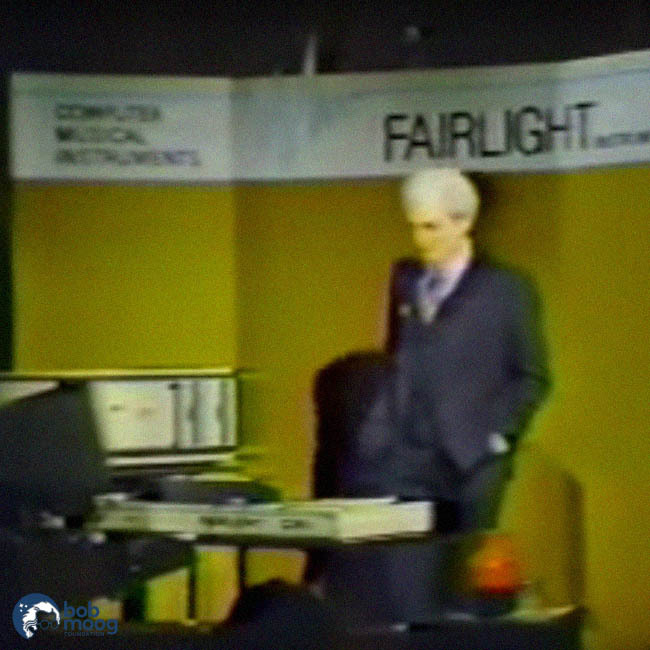 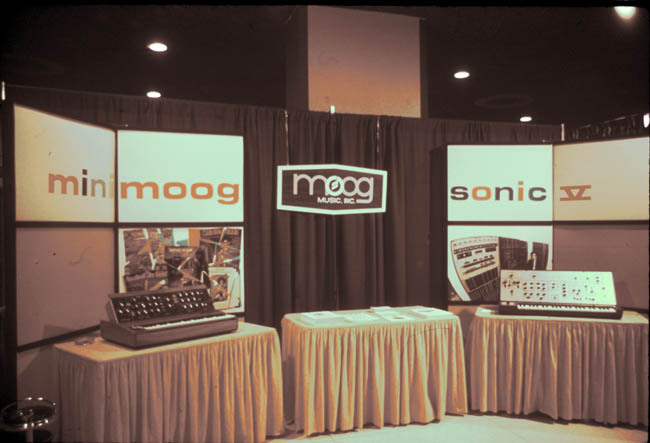 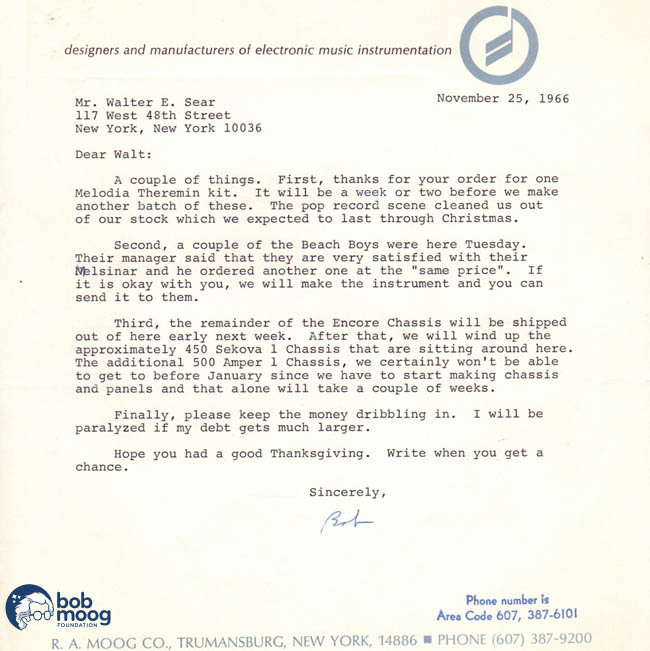 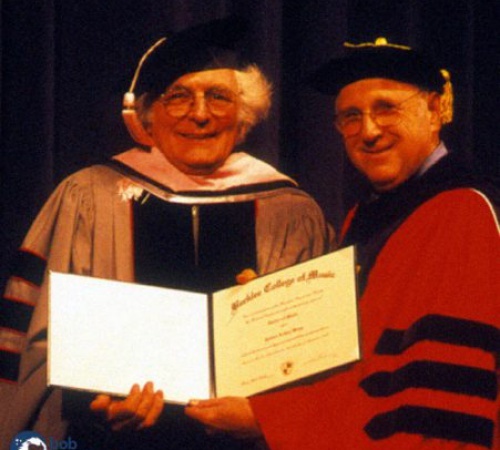 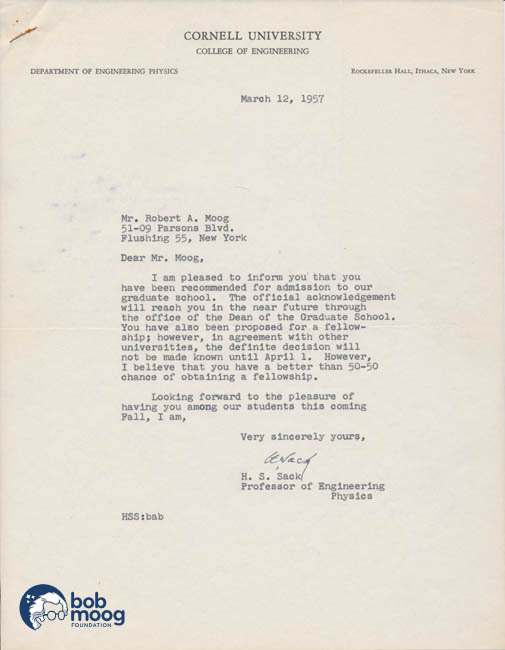 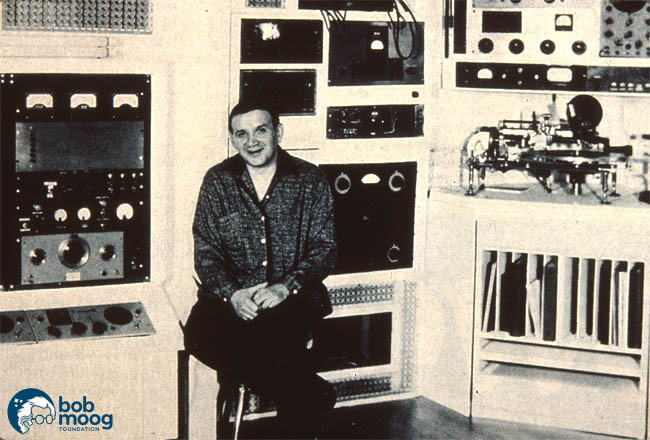 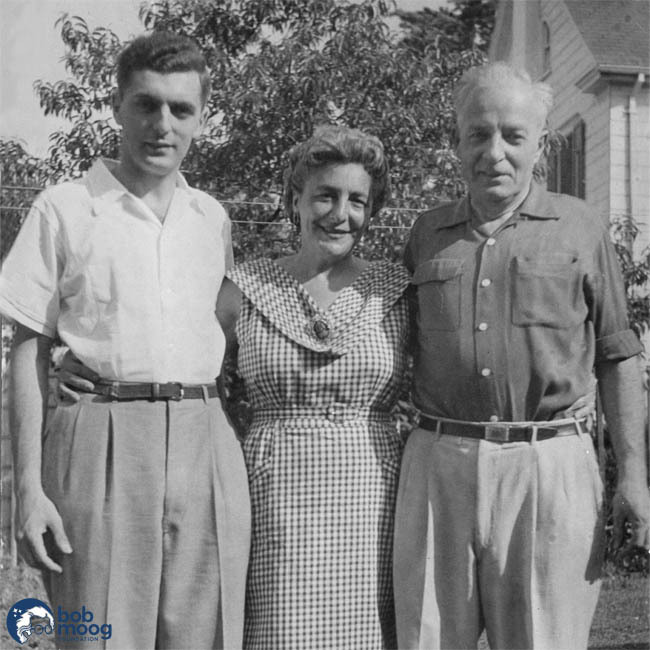 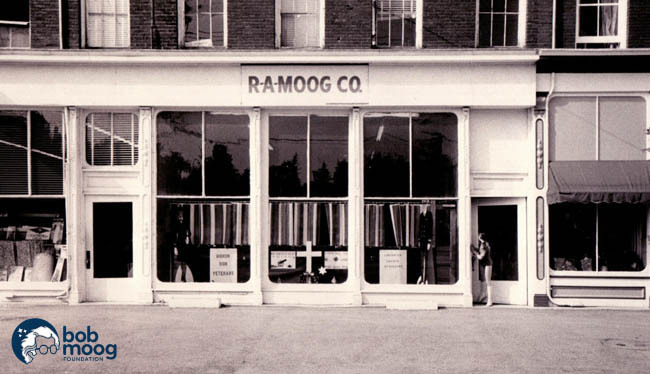 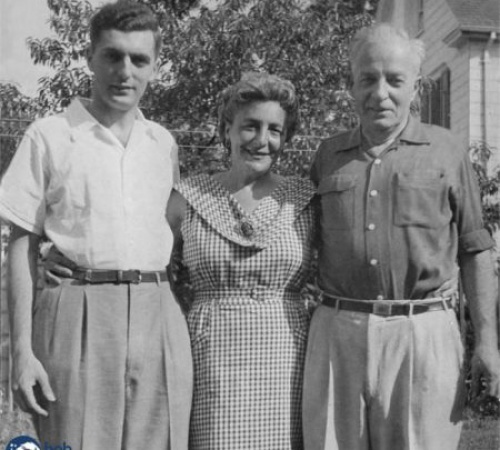 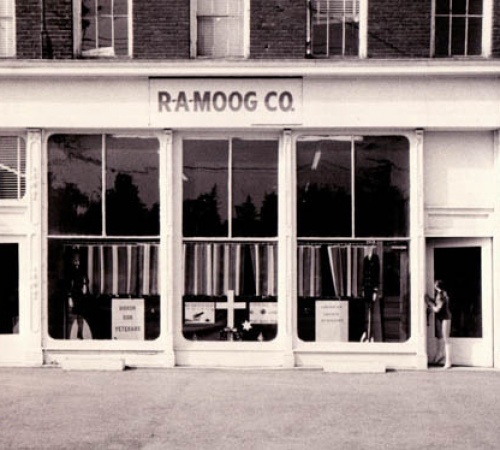 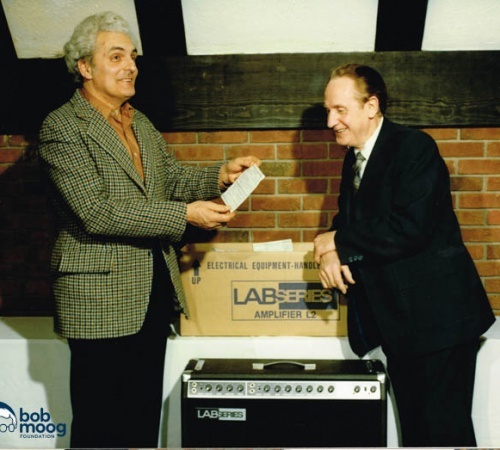 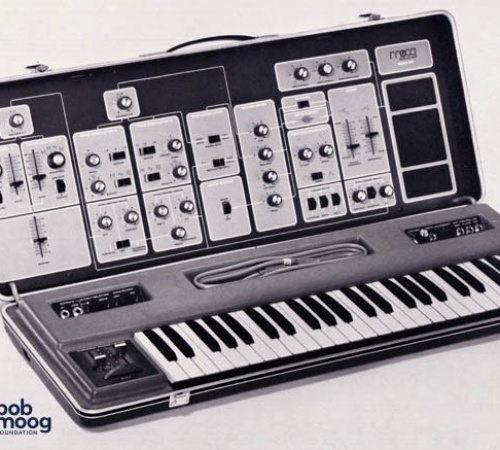 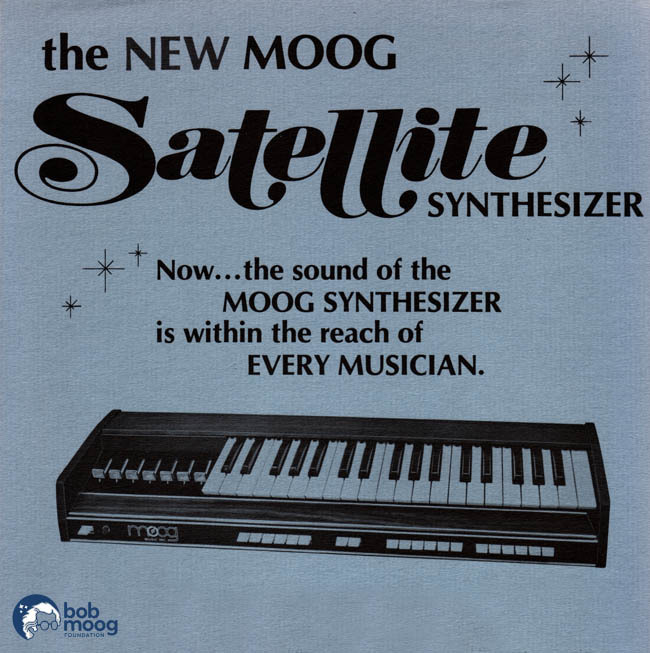 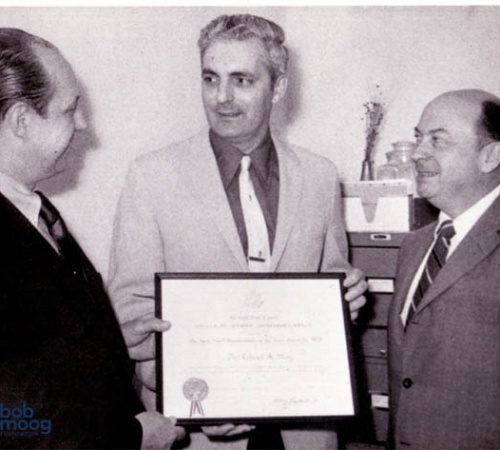 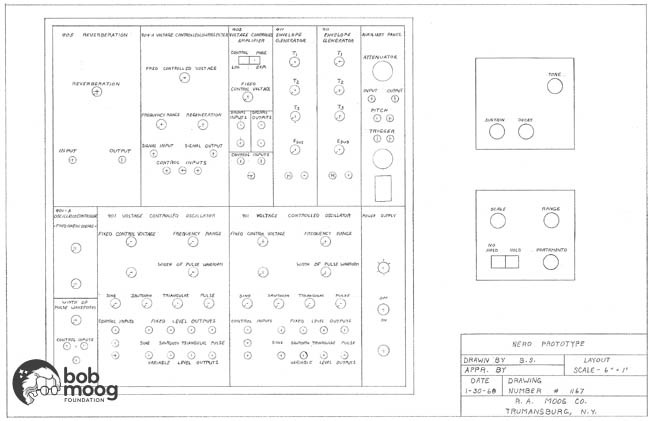 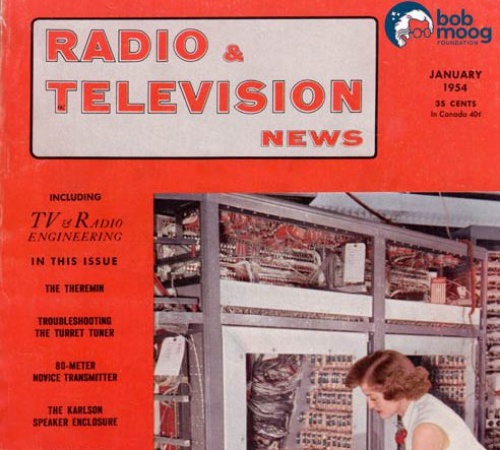 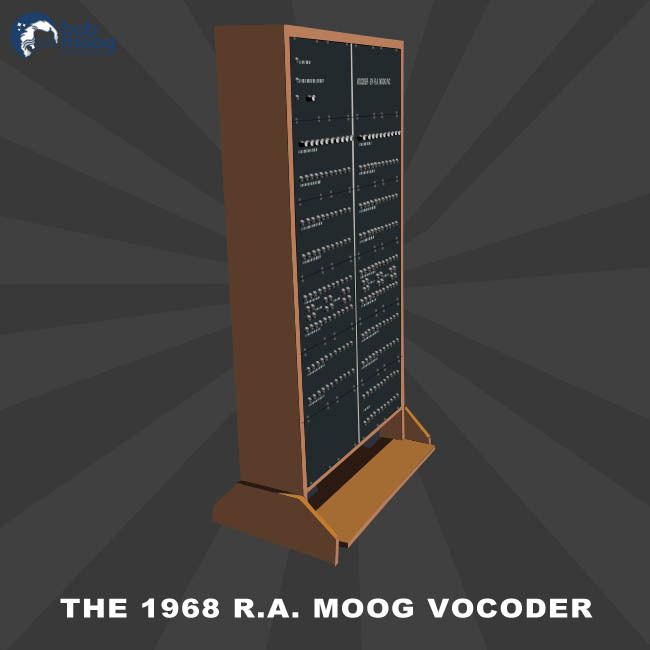 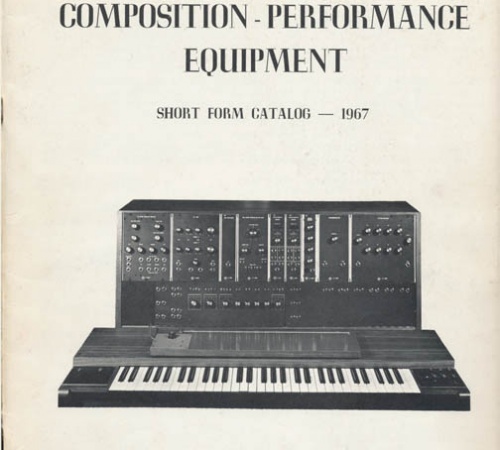 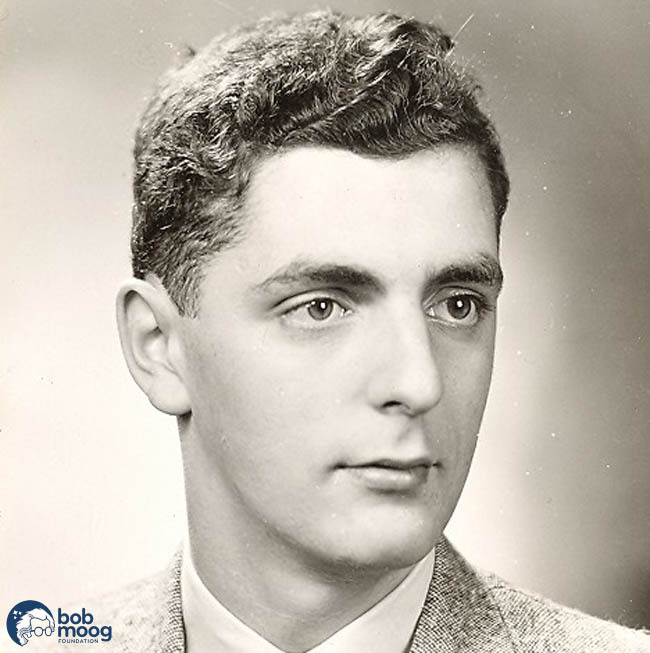 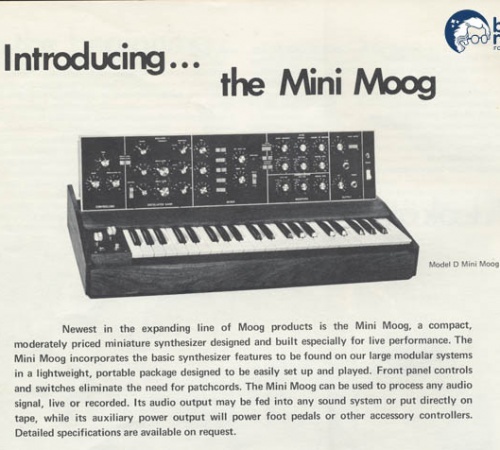 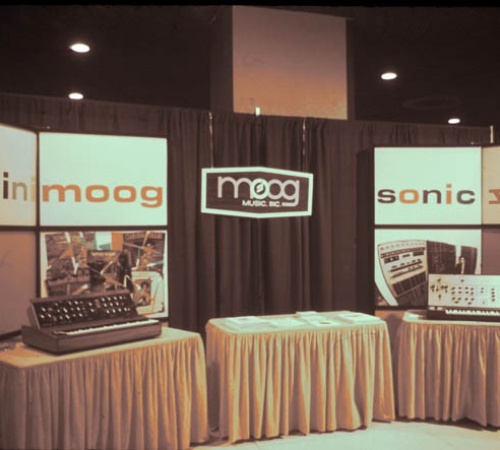 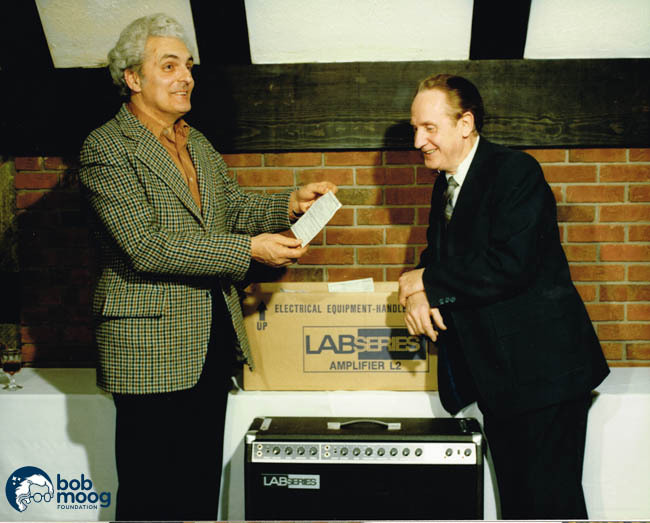 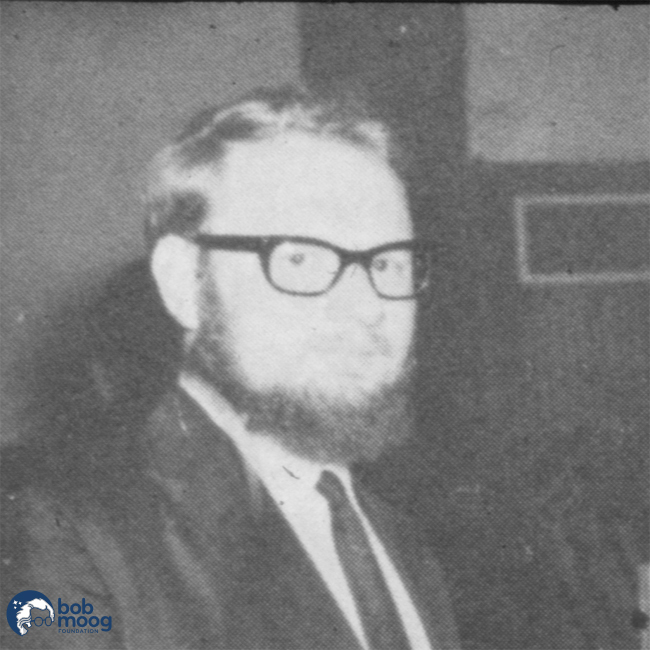 1954 - RAMCO IS RENAMED R.A. MOOG CO. 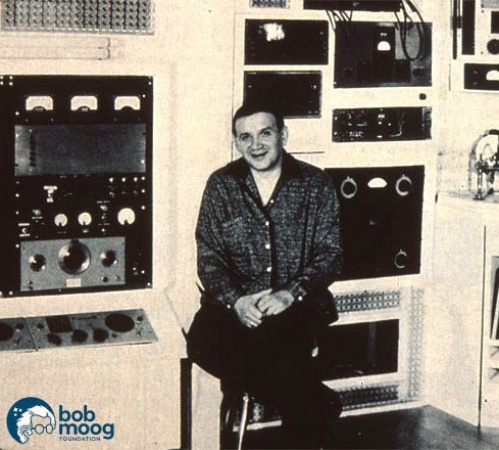 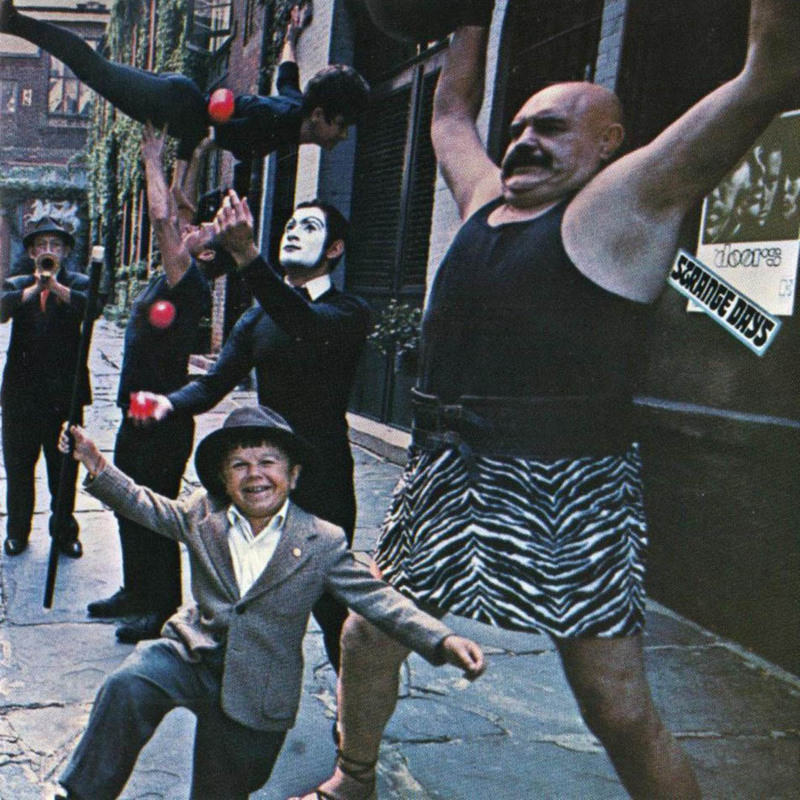 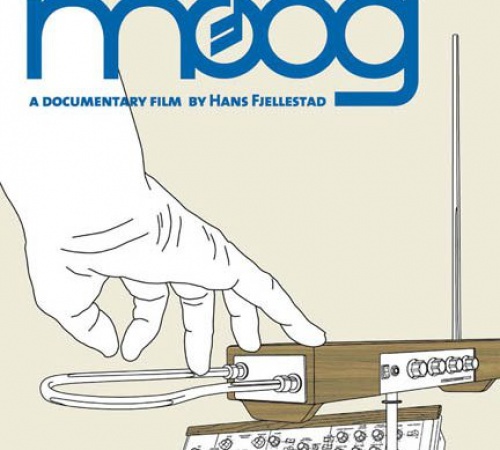 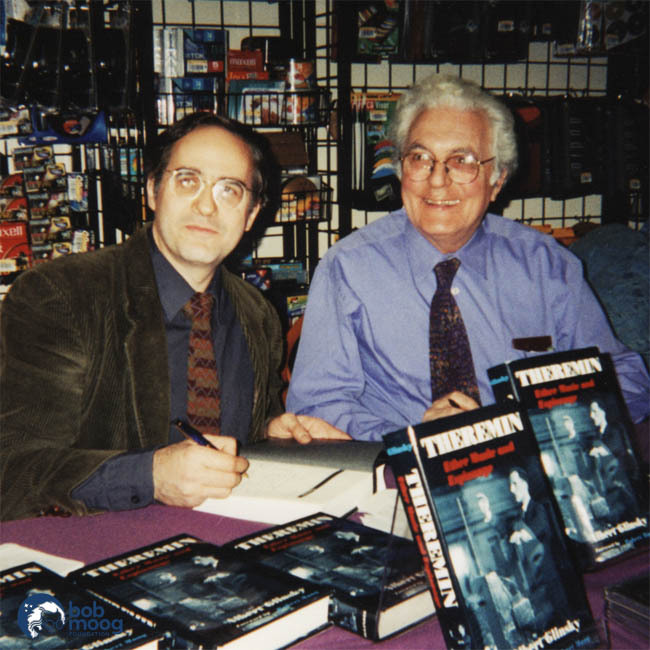 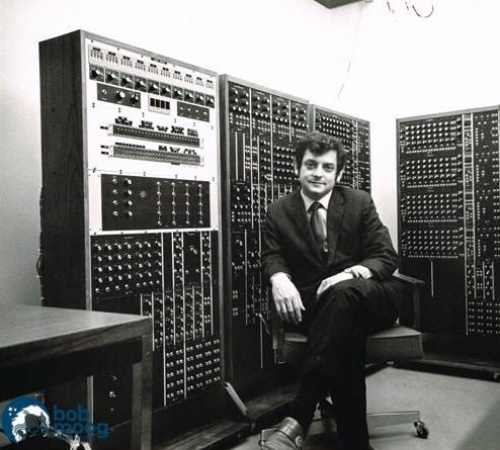 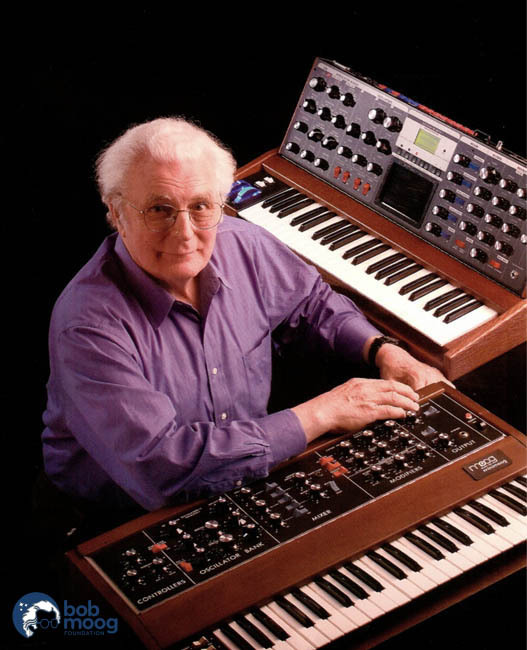 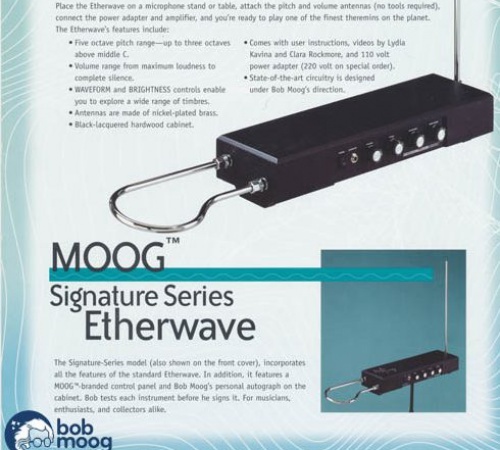 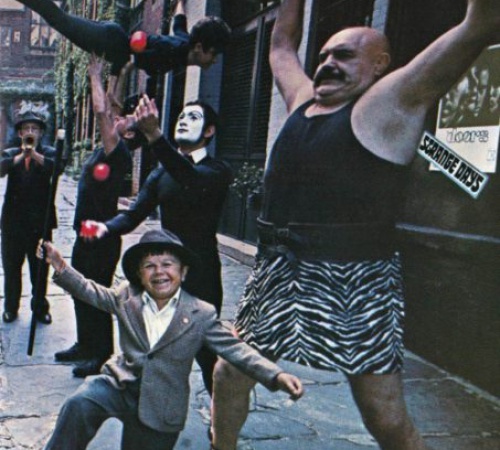 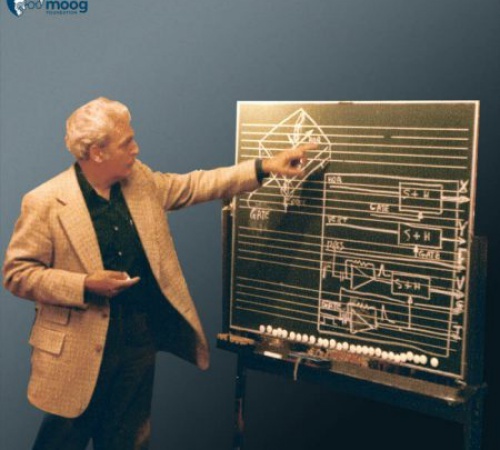 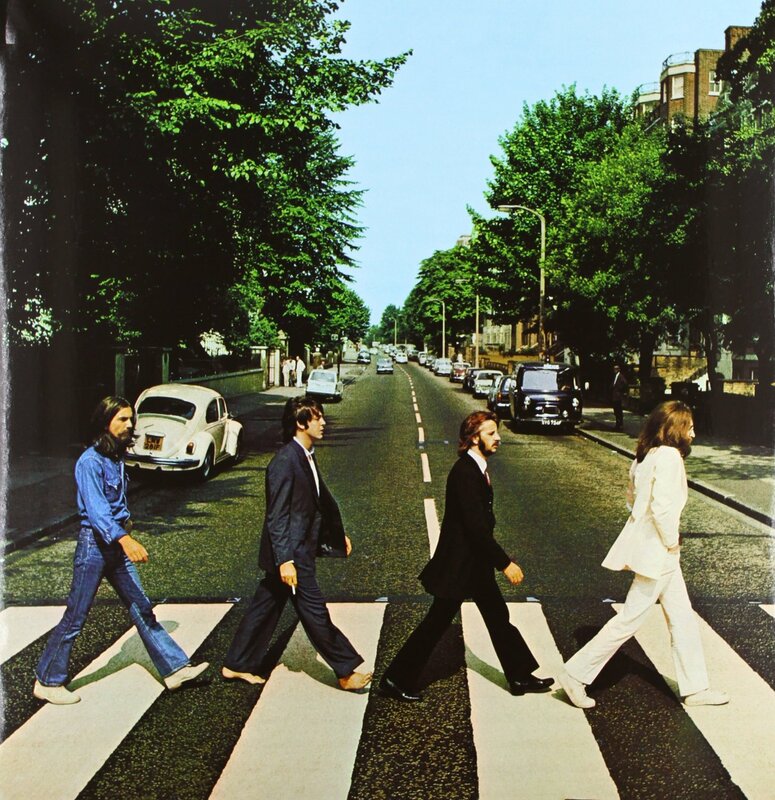 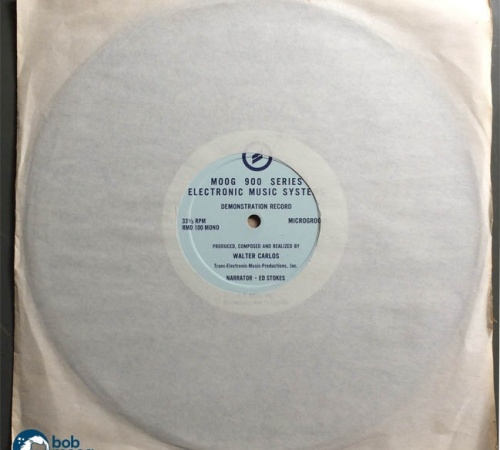 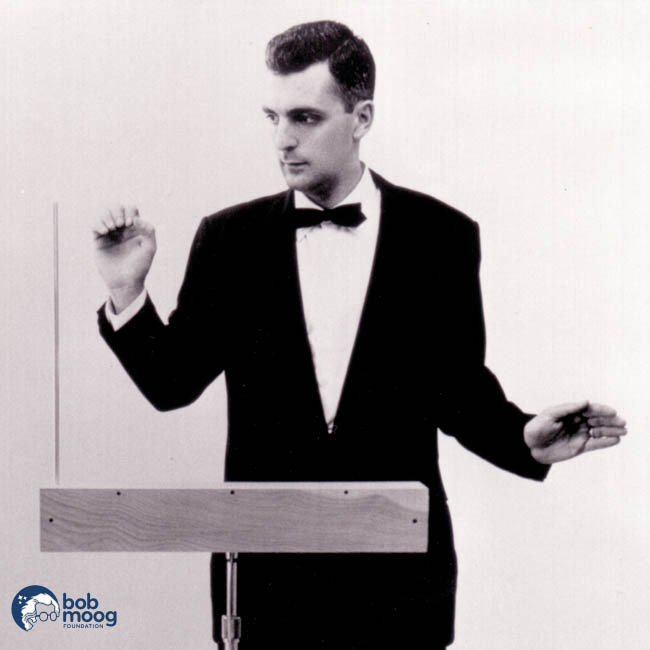 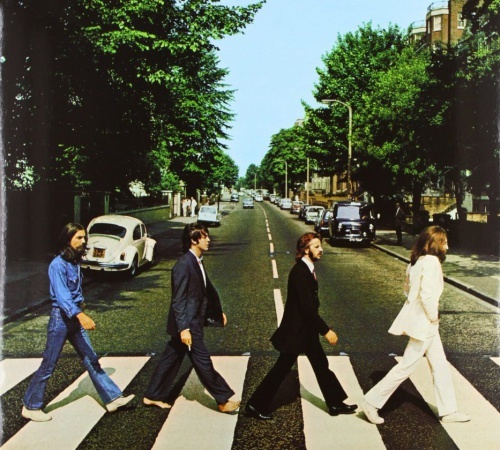 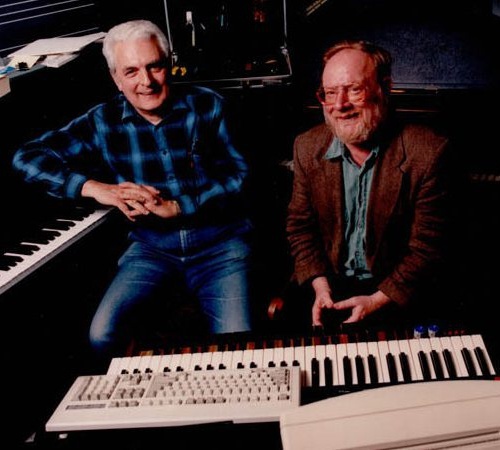 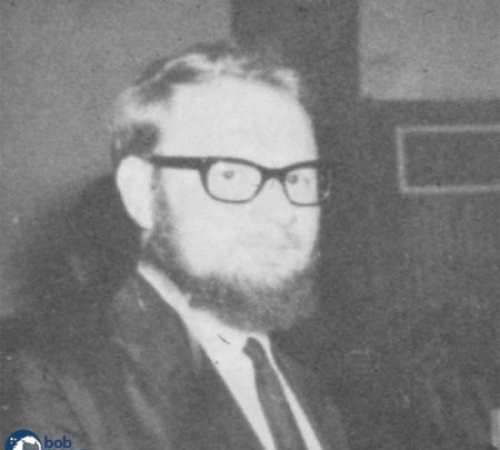 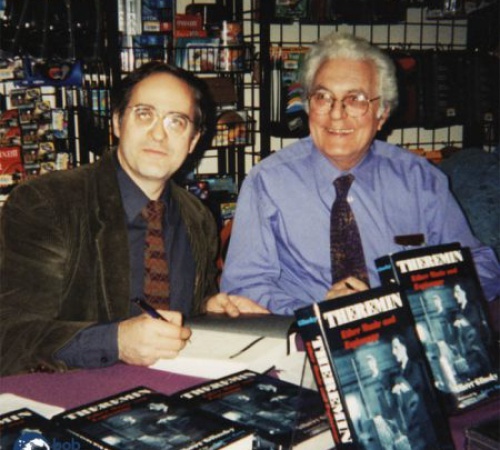 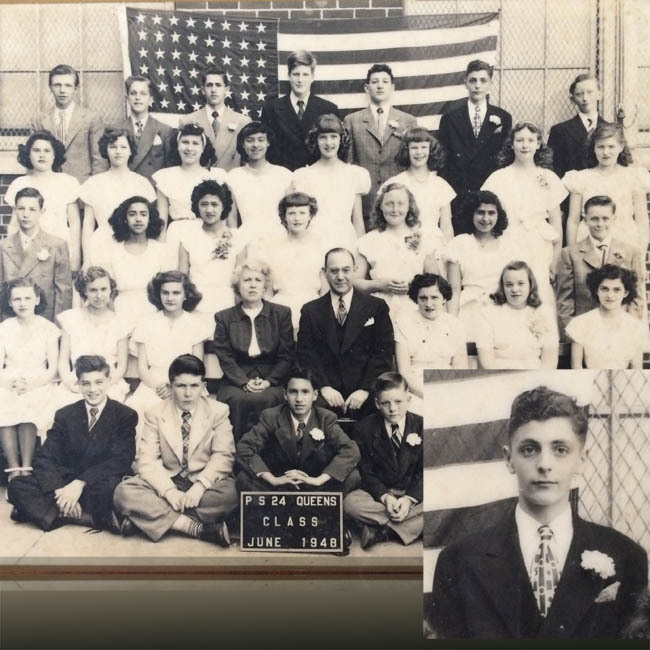 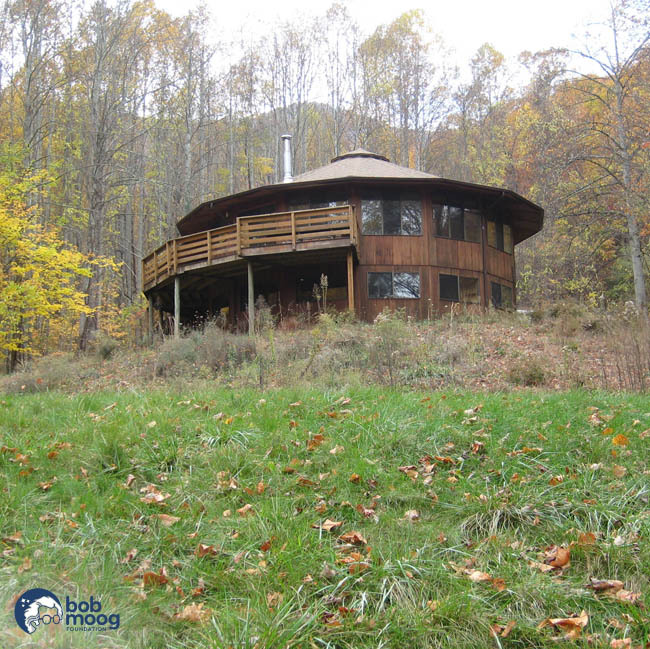 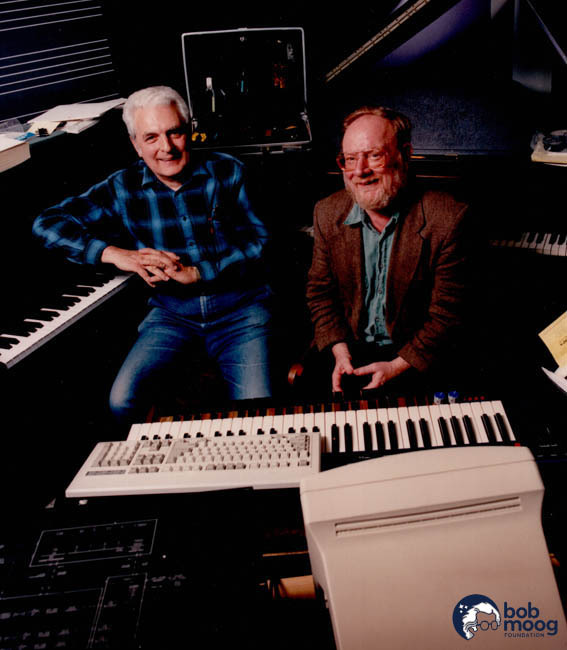 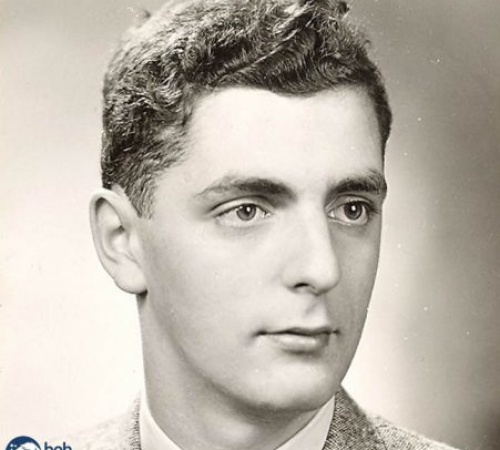 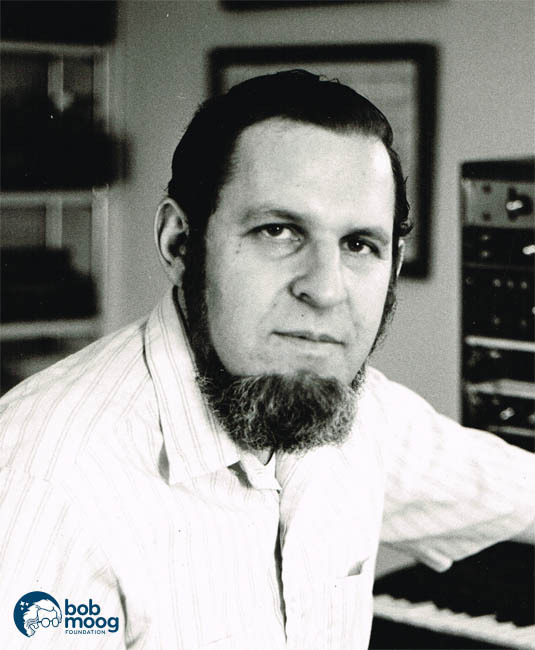 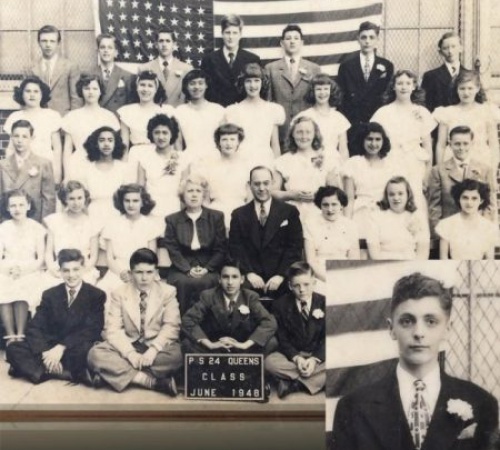 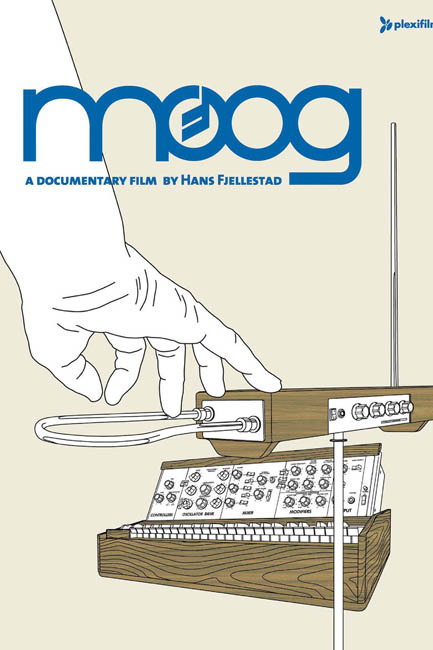 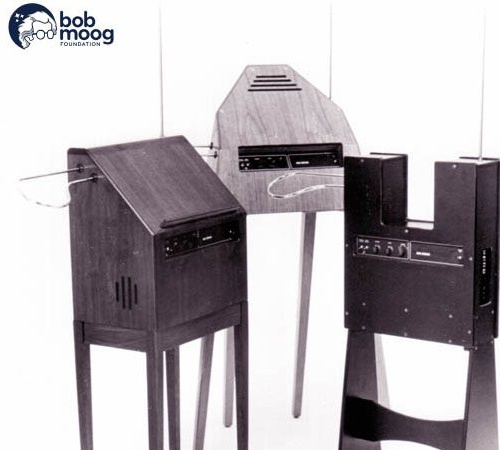 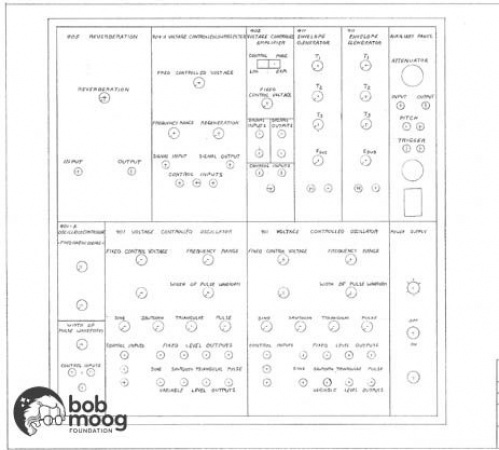 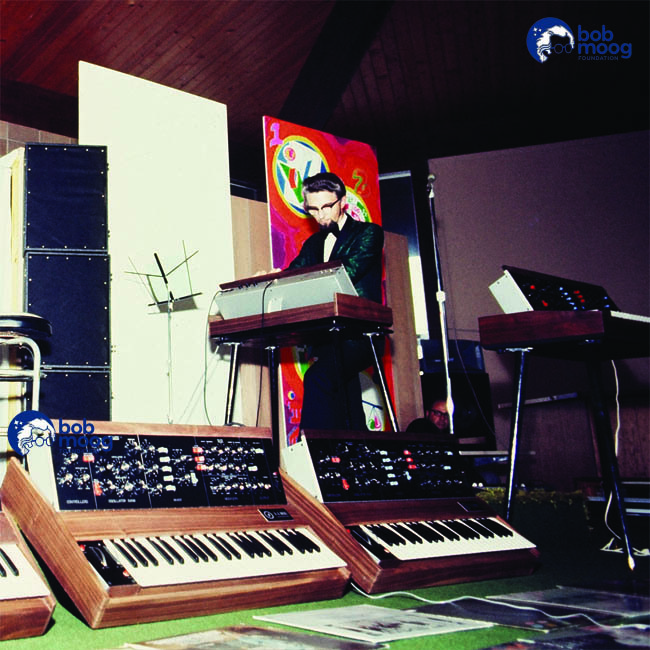 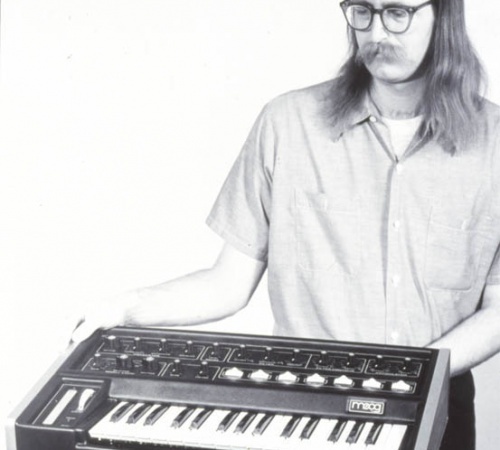 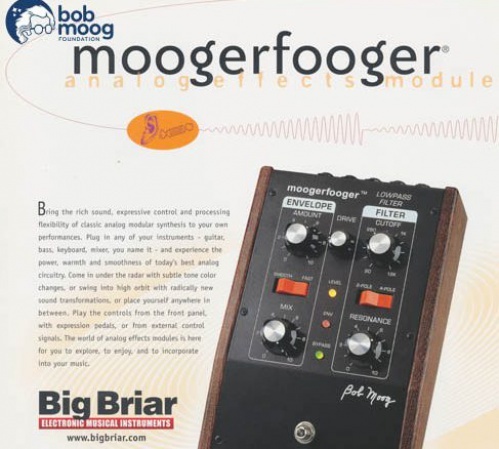 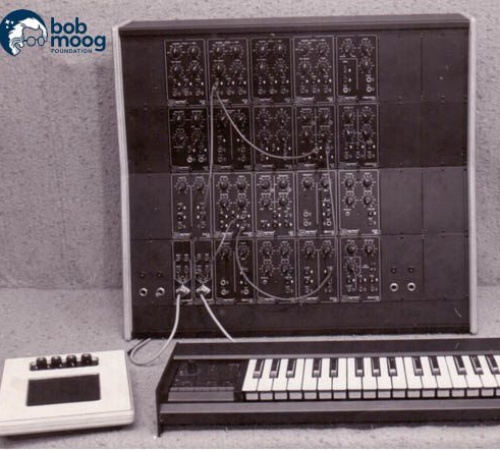 Under his newly named company R.A. Moog Co., Bob creates the Model 301 and Model 351 theremins. 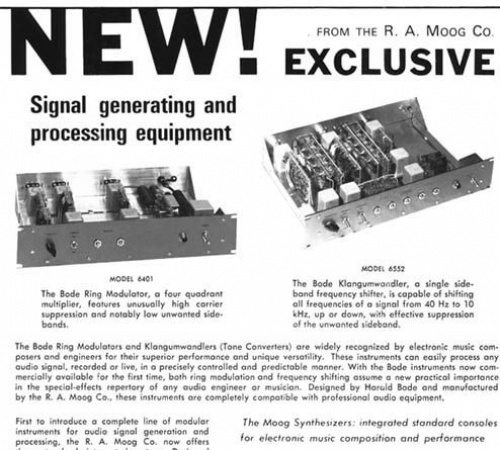 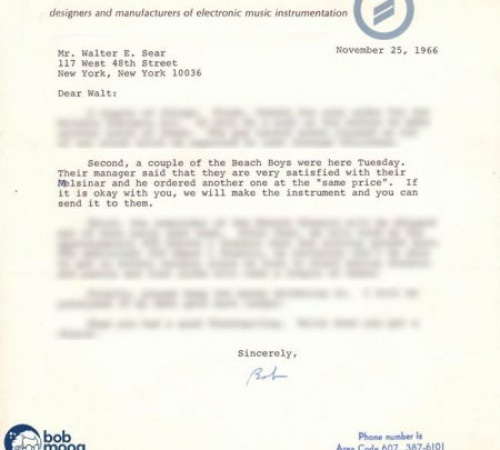 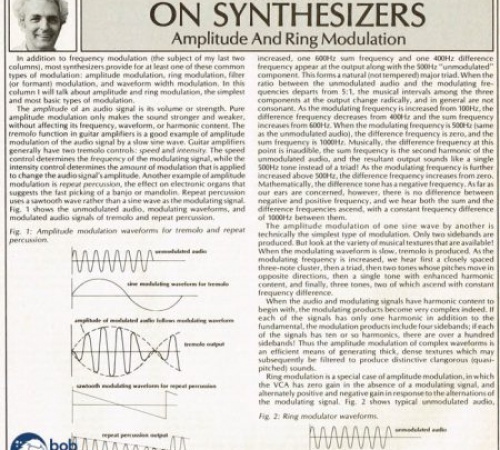 The Model 351 features tone-shaping functionality that hints at Bob?s future in synthesis. 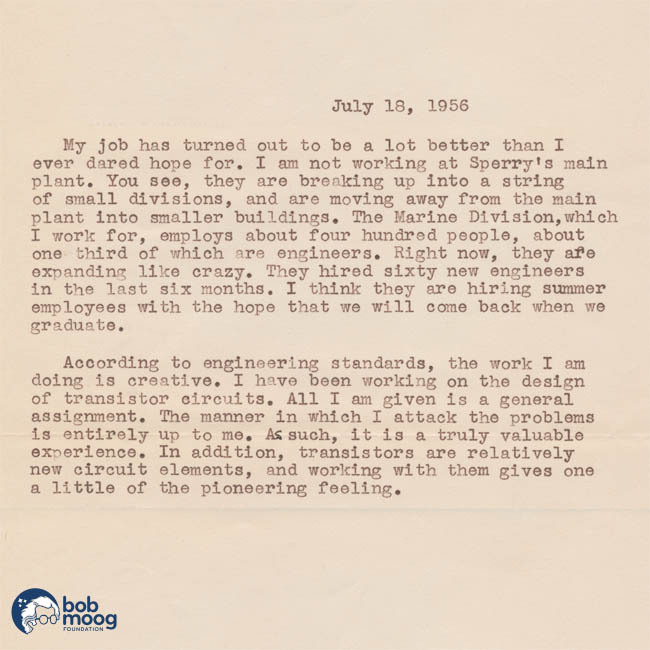 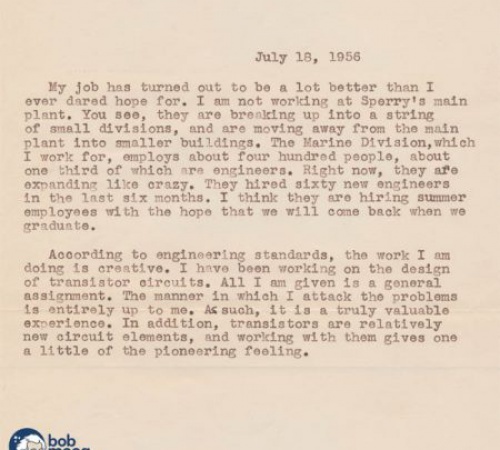 Bob works in the Marine Department for Sperry, an electronics and equipment manufacturer in New York, as student engineer for the summer. 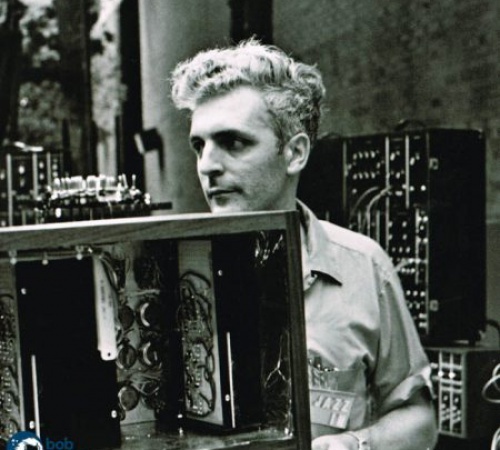 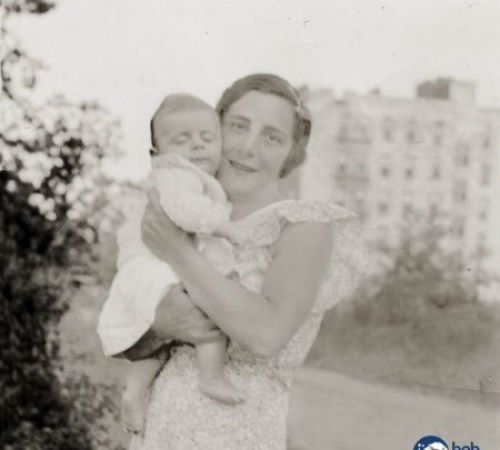 This is the first time he works with the burgeoning technology of transistors. 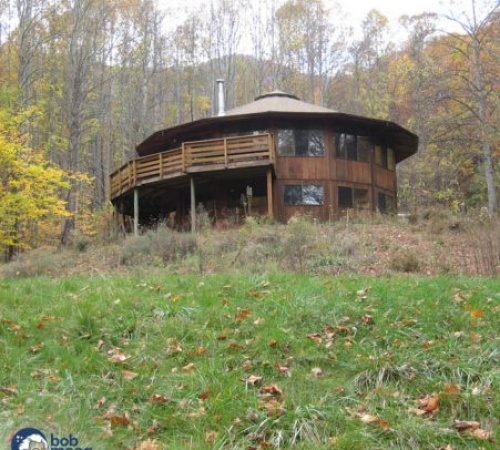 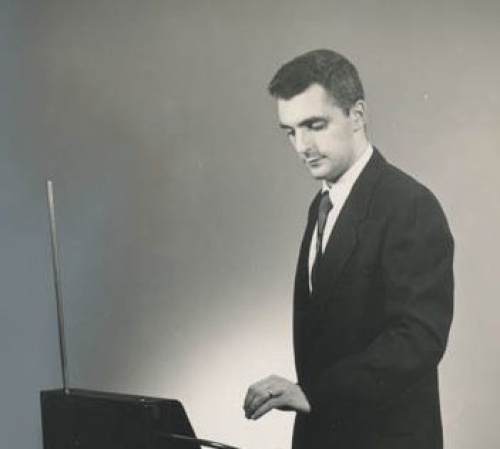 In Ithaca, New York, Bob creates the Vanguard theremin. 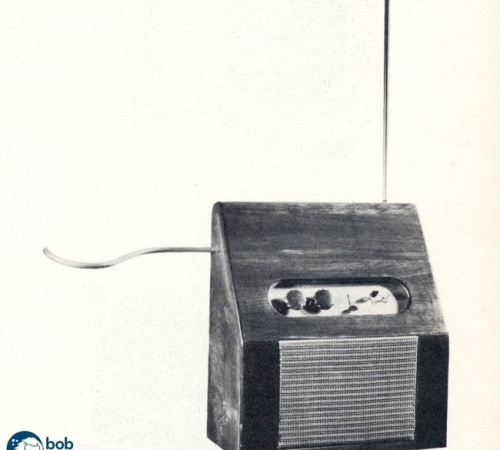 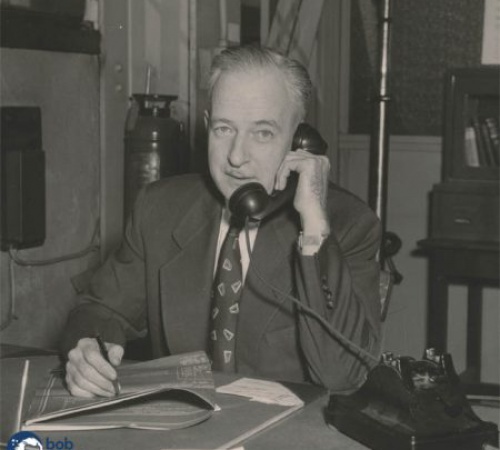 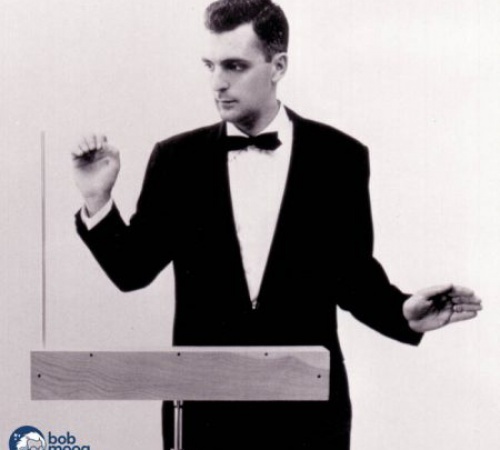 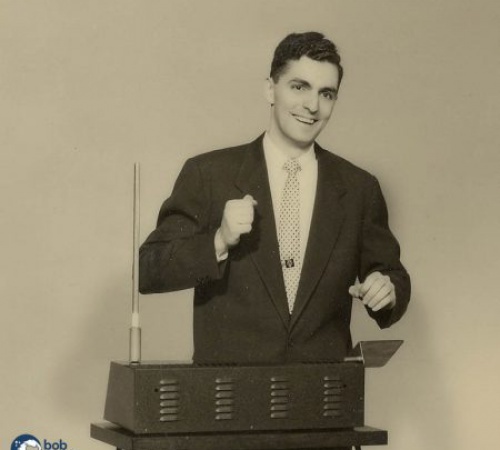 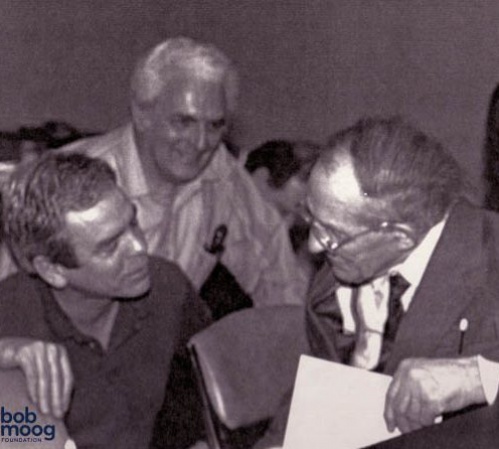 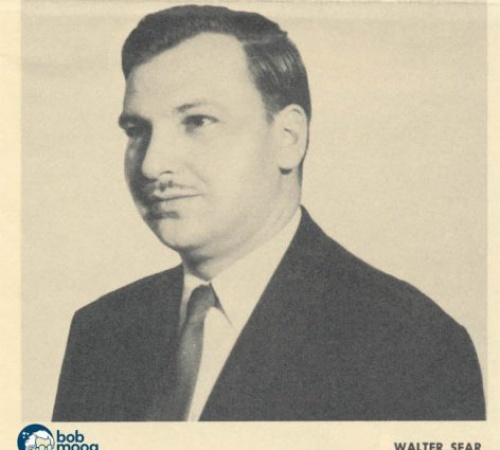 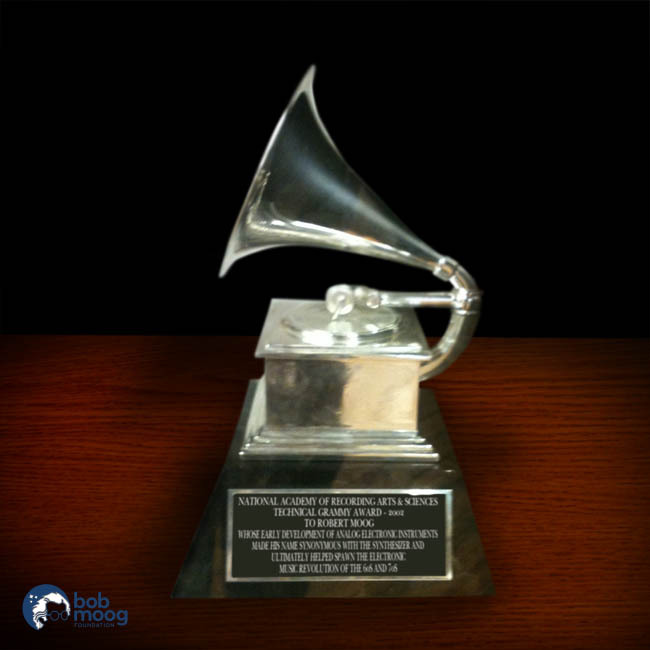 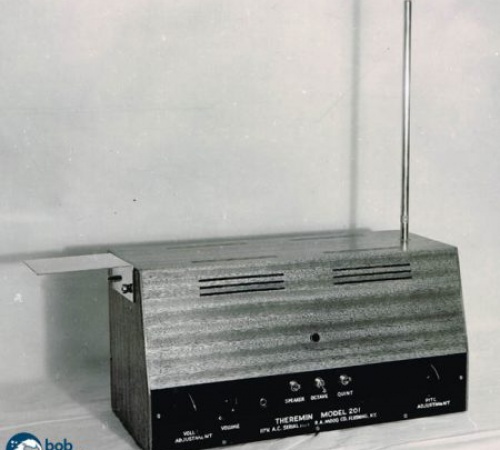 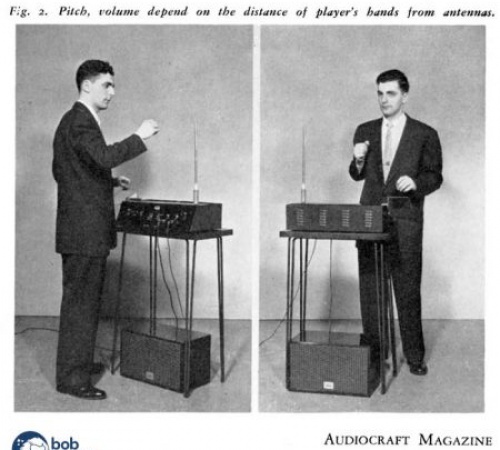 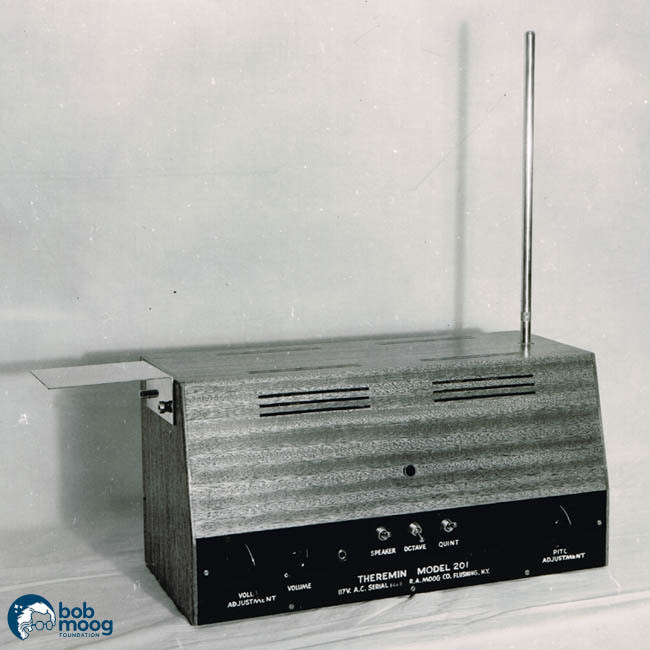 While the name might suggest a device on the forefront of technological advance, the Vanguard was the last theremin Bob designed using the older technology of vacuum tubes. 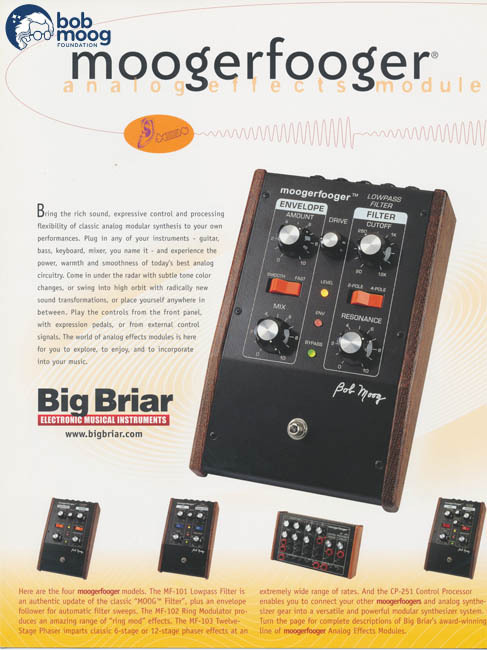 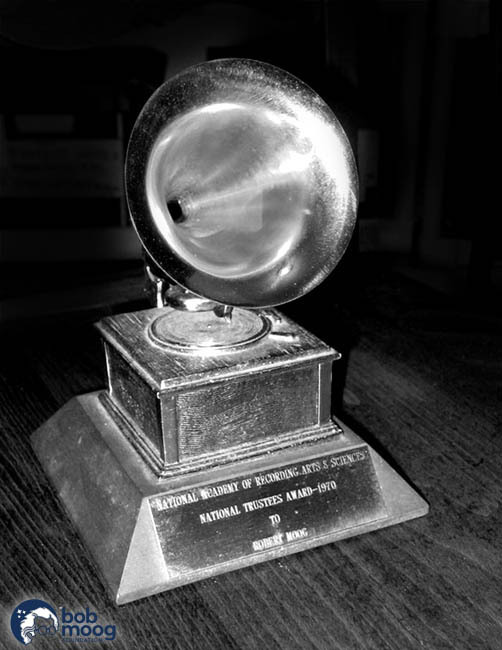 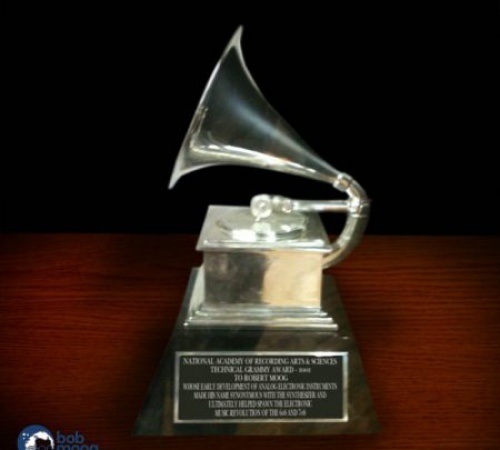 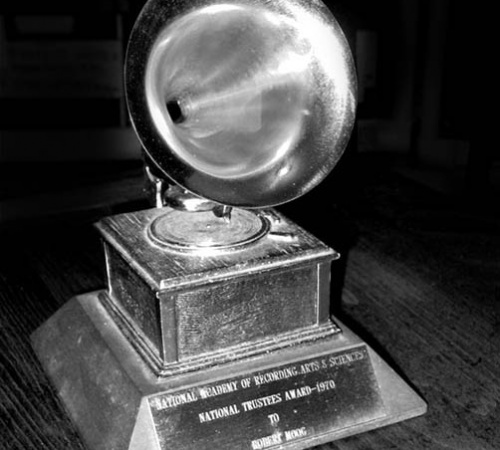 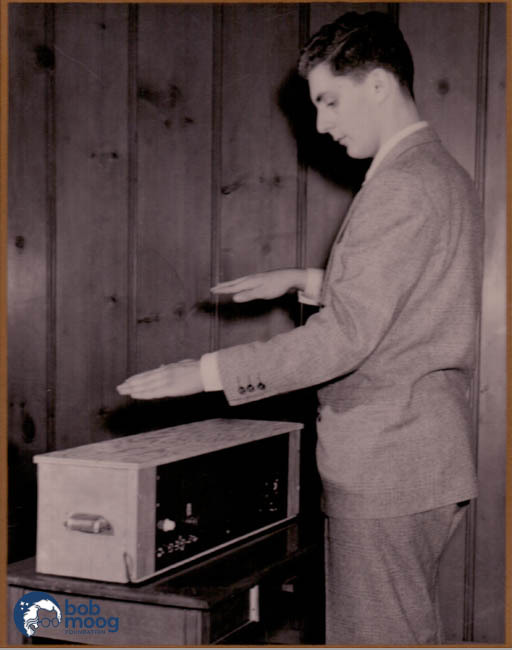 Its wedge-shaped mahogany case was reminiscent of the RCA theremin. 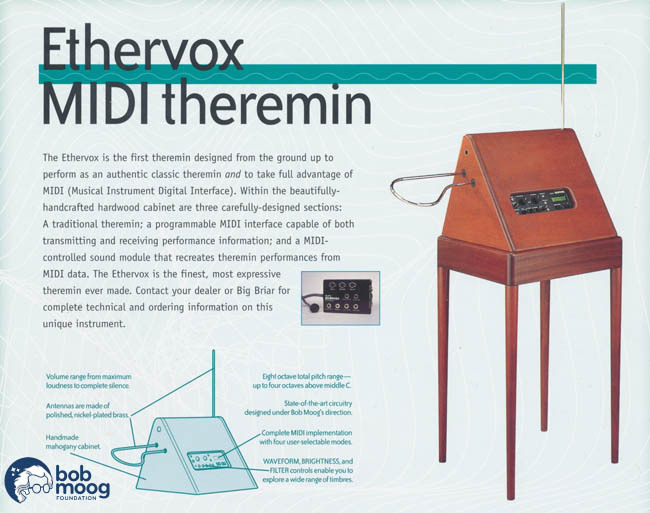 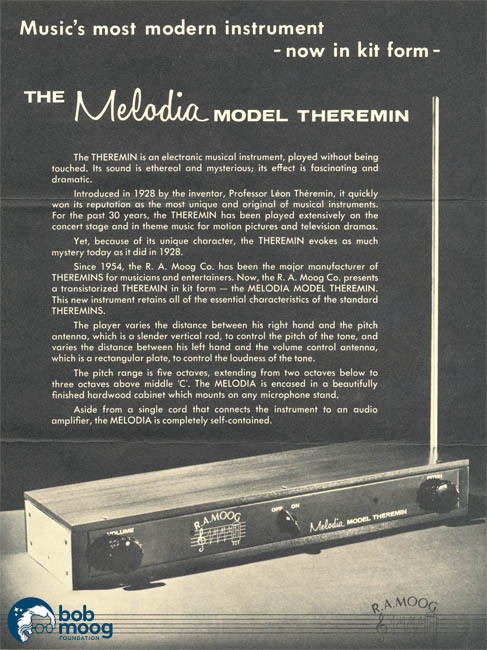 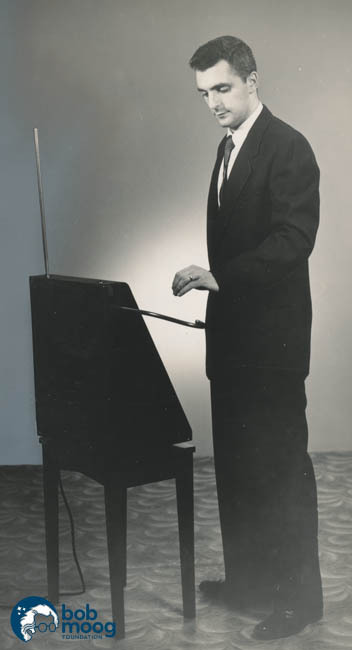 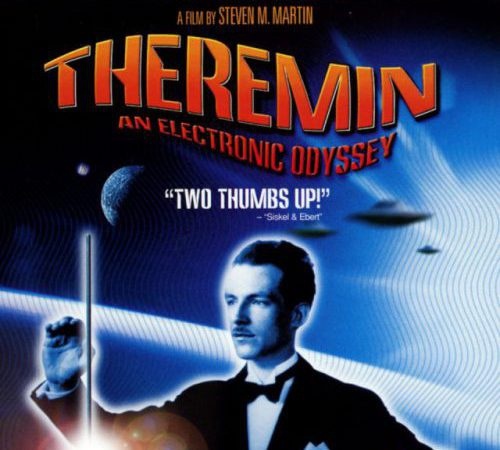 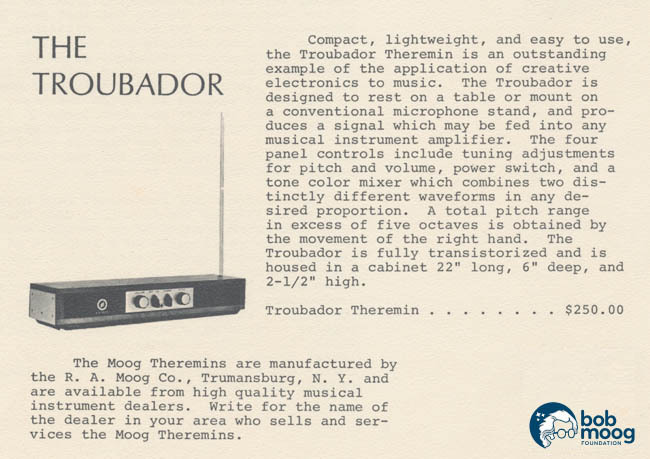 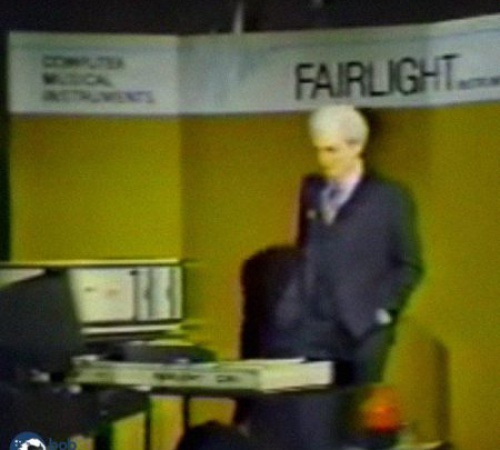 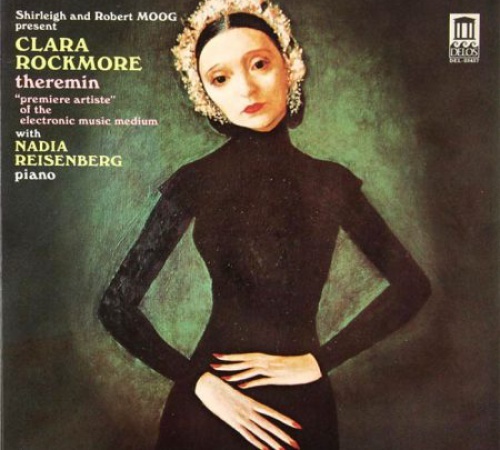 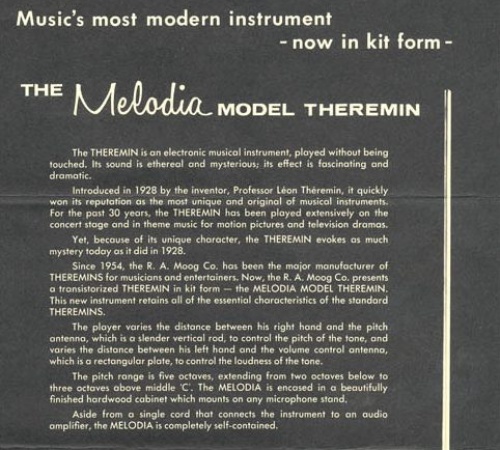 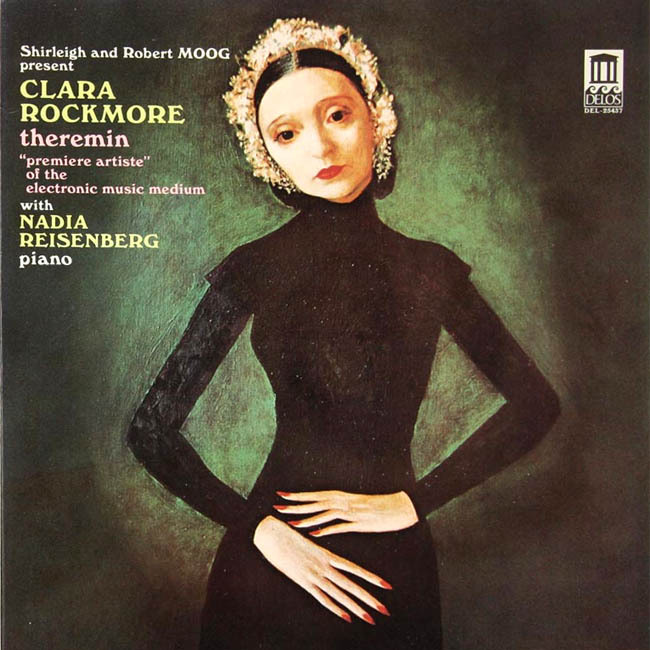 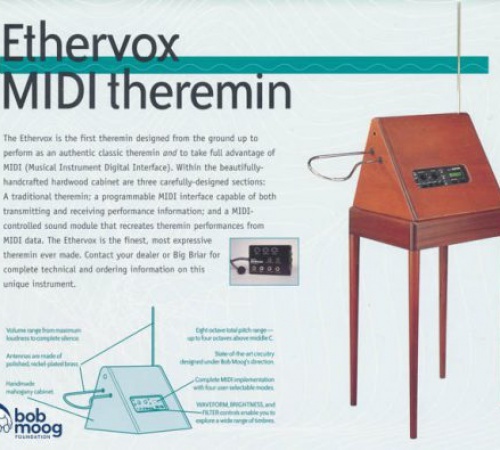 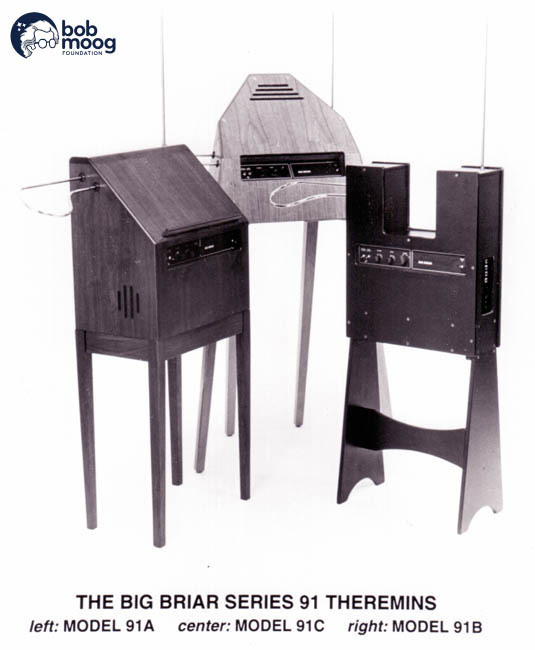 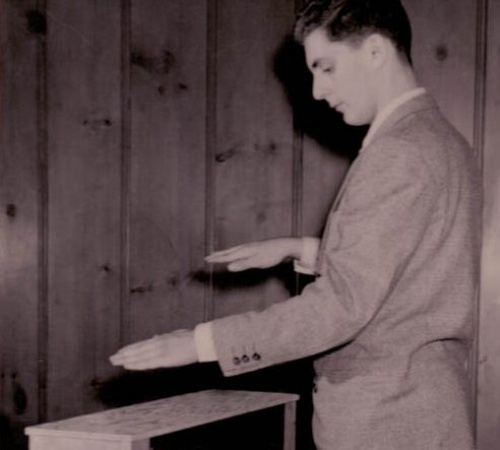 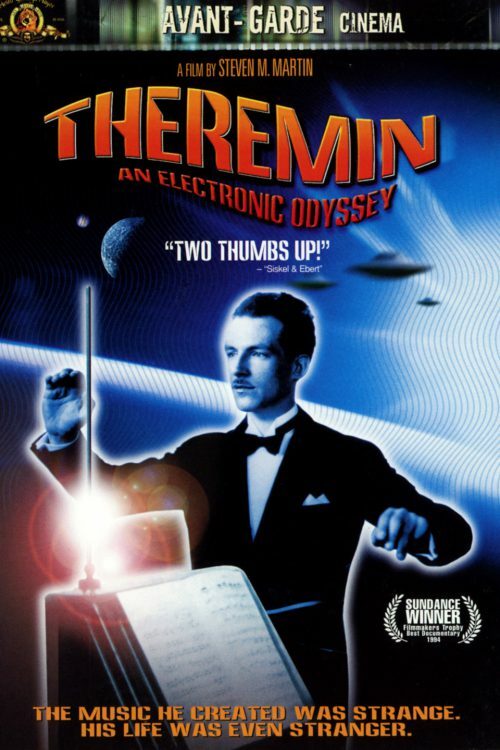 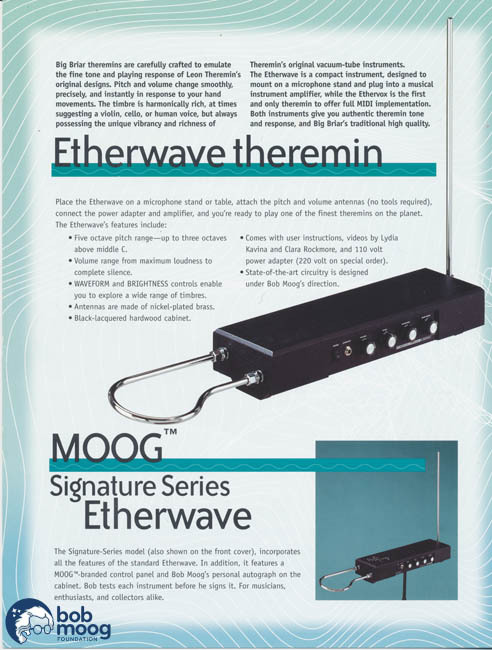 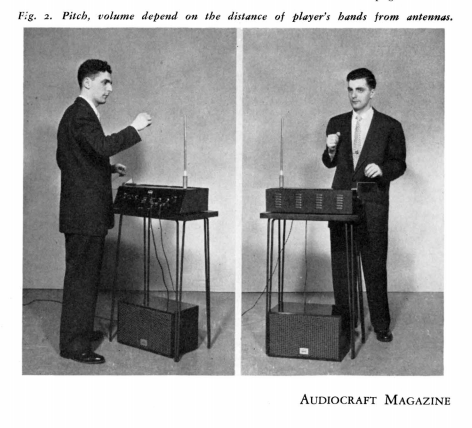 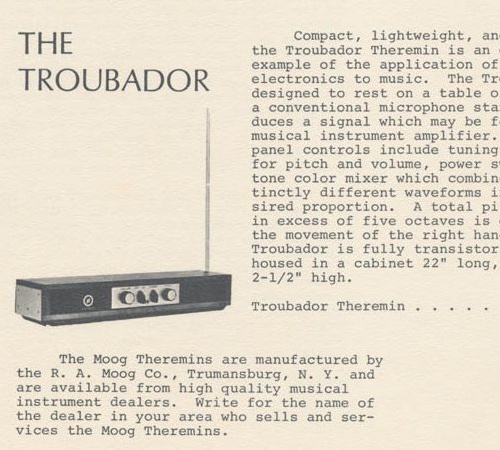 The Vanguard featured an "all-in-one" approach that placed the loudspeaker within the theremin itself. 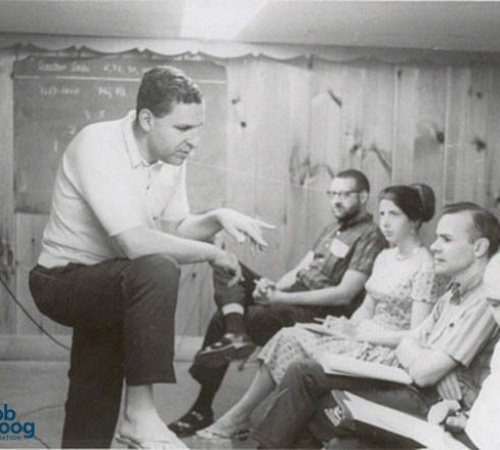 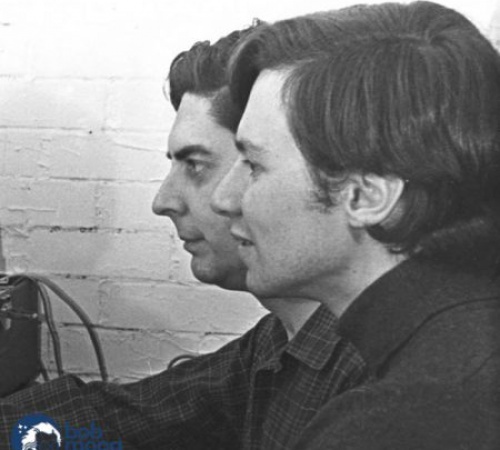 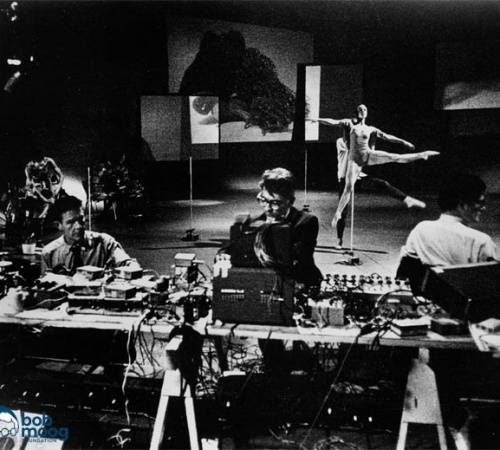 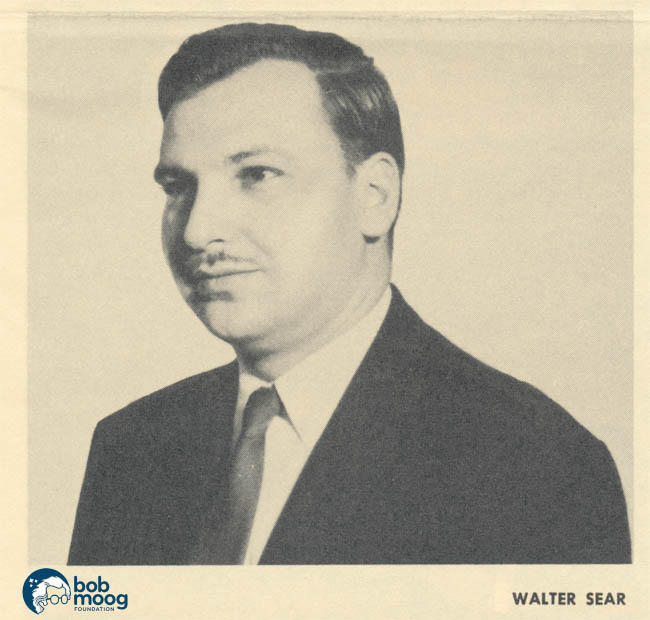 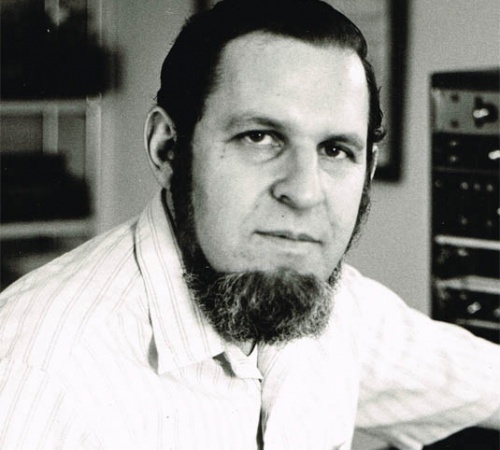 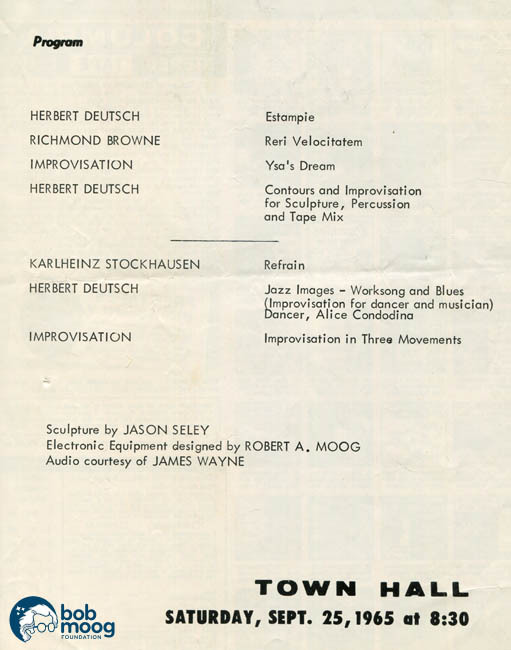 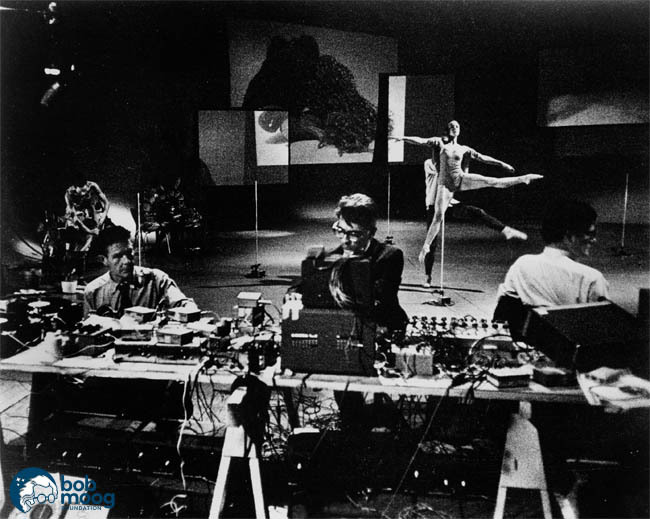 1963 - WALTER SEAR JOINS R.A. MOOG CO.
Bob builds movement-sensing rhythmic devices for John Cage's performance "Variations V," which were activated by dancers performing Merce Cunningham's choreography. 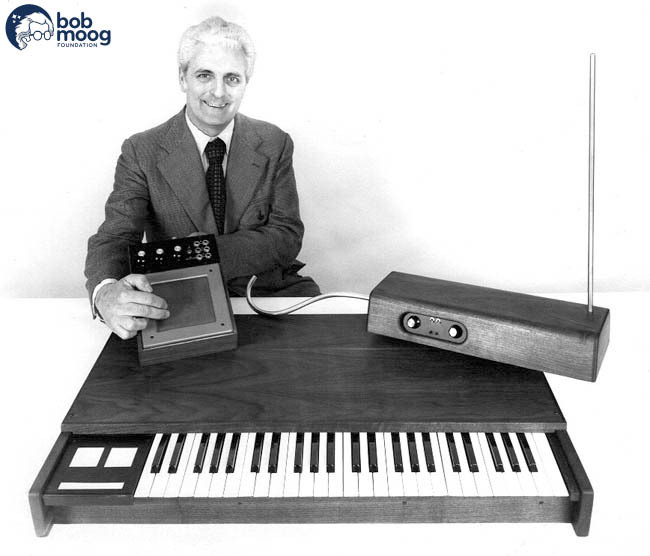 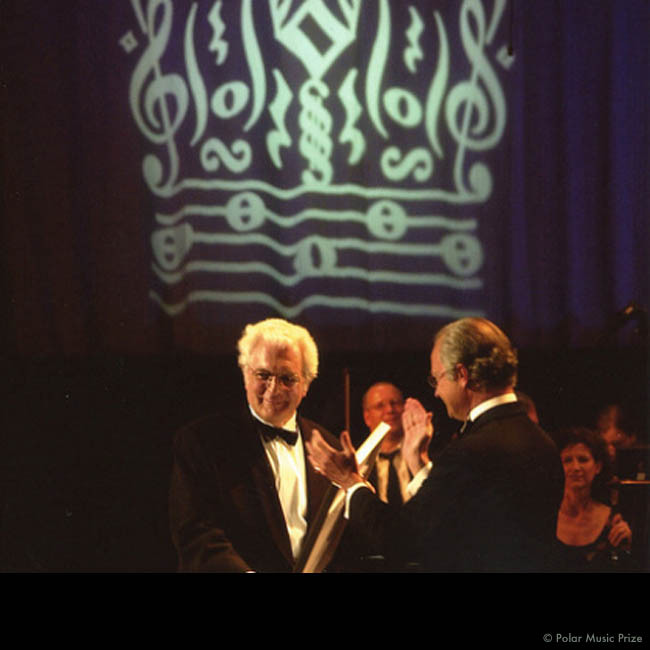 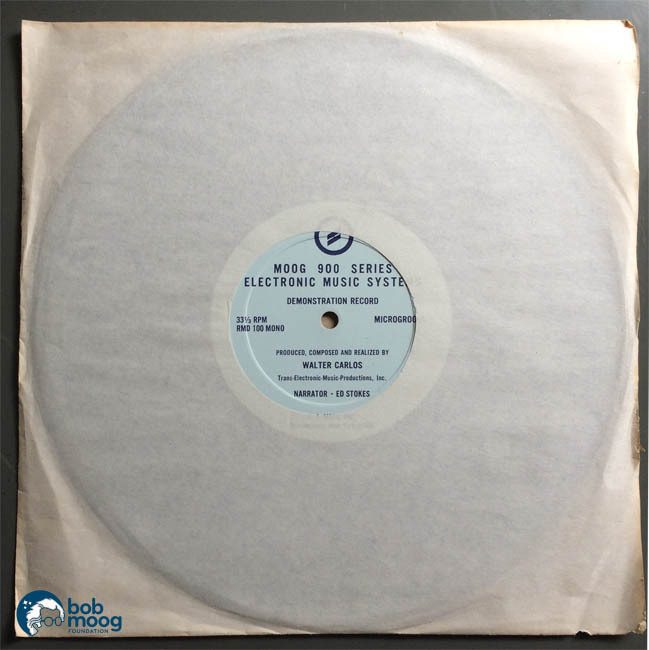 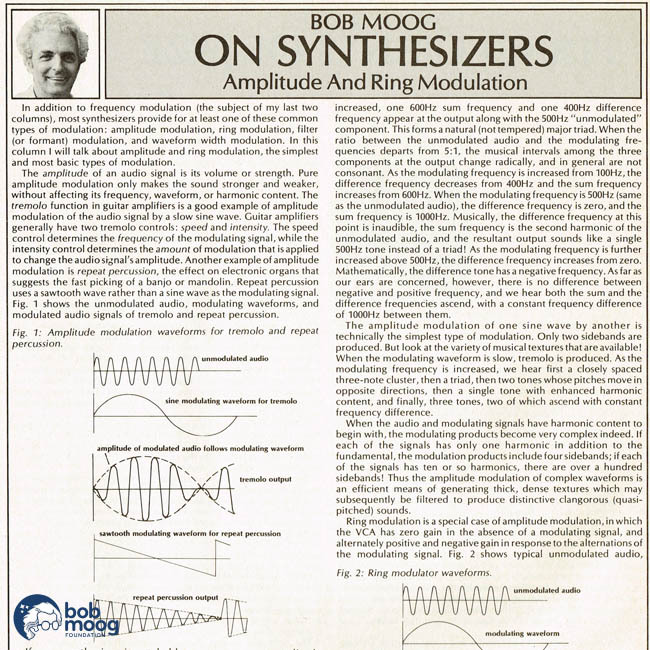 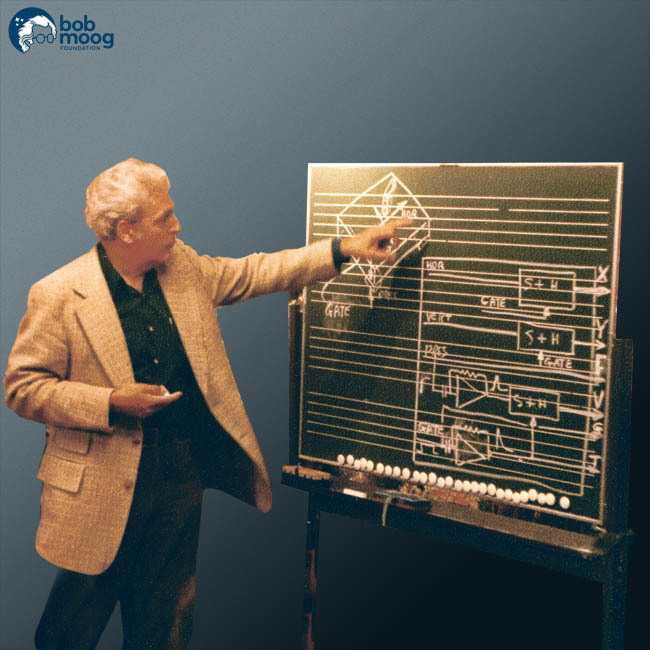 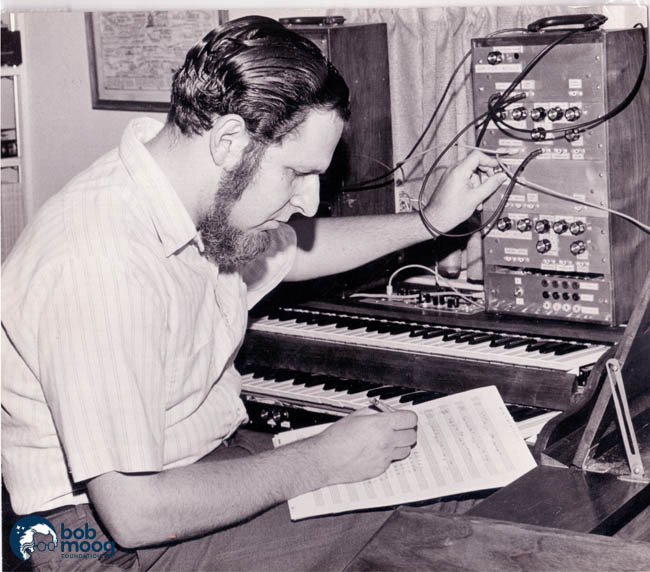 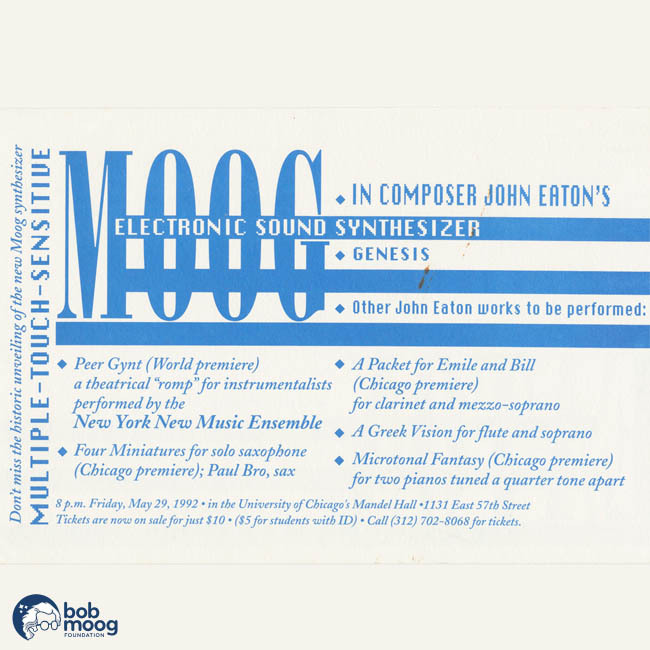 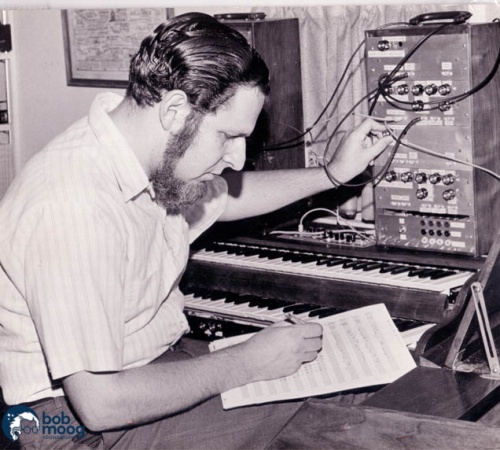 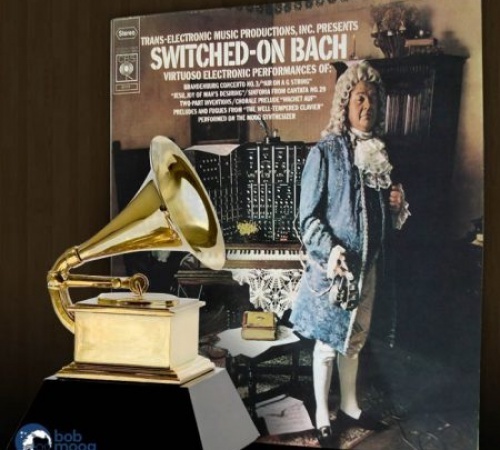 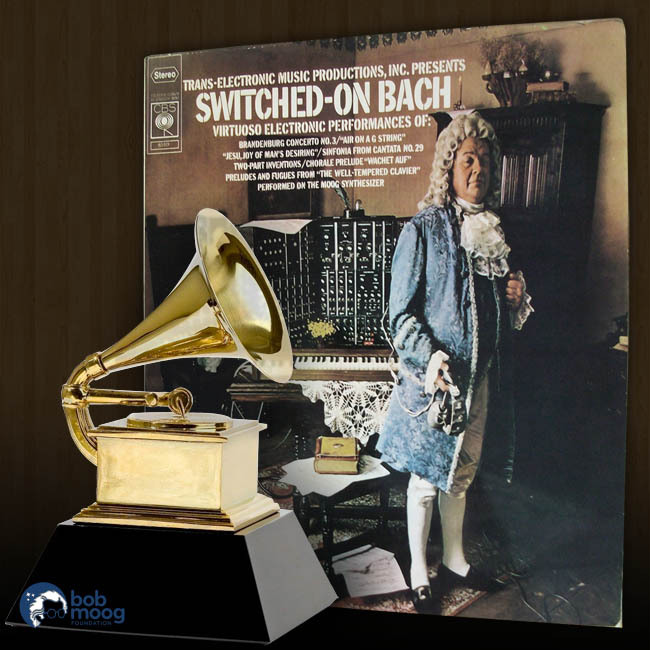 Bob creates a synthesizer from a commission by famous pianist Peter Nero. 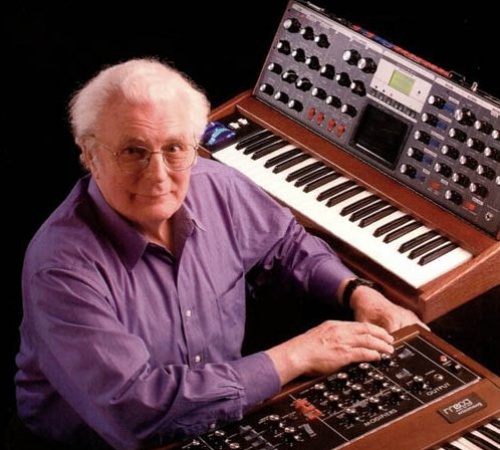 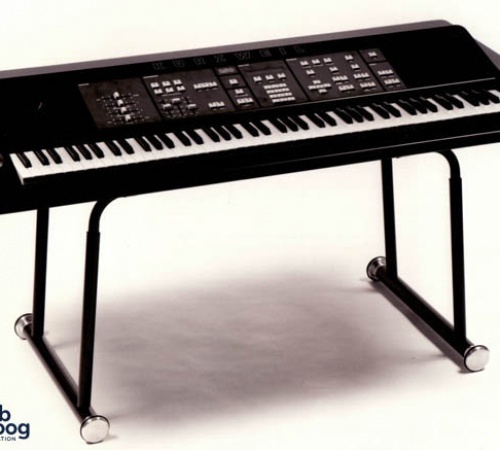 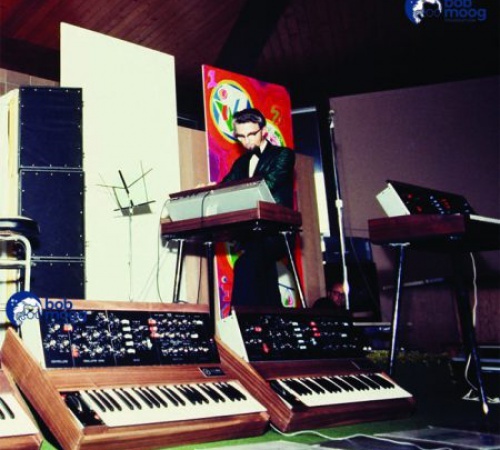 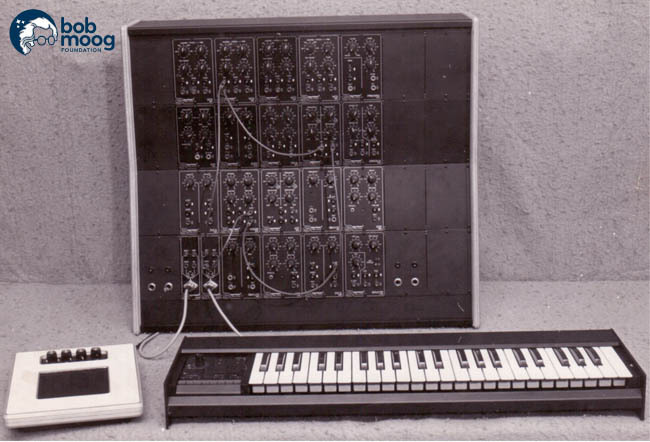 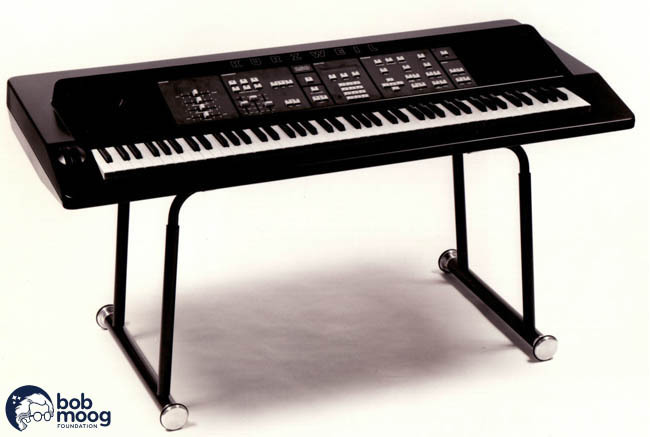 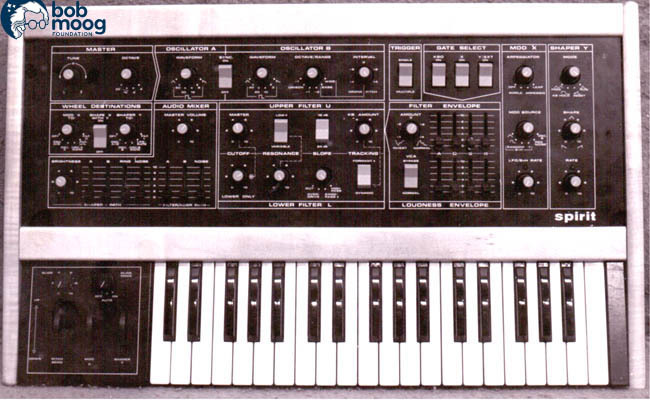 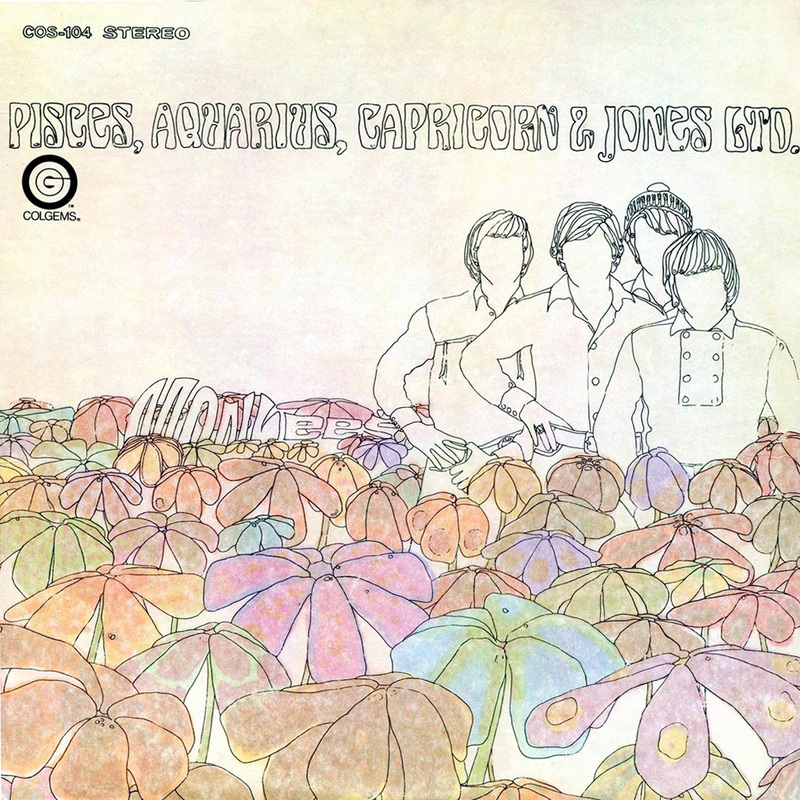 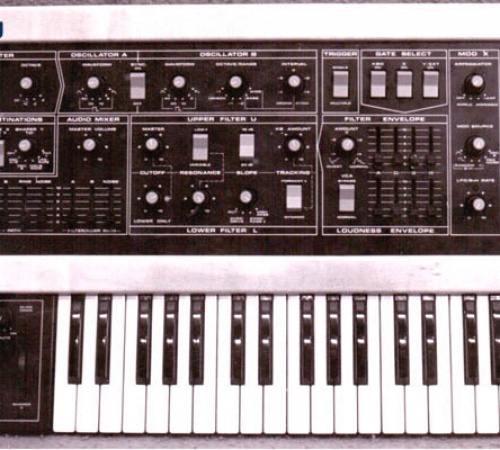 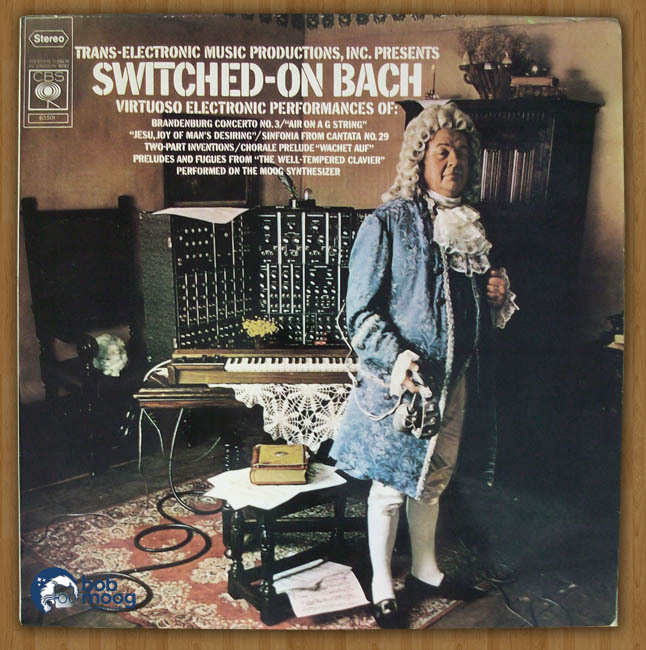 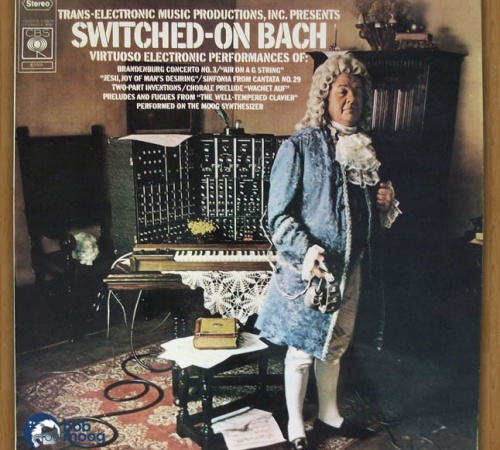 The synthesizer was a limited set of modules in a case that fit beneath the piano bench. 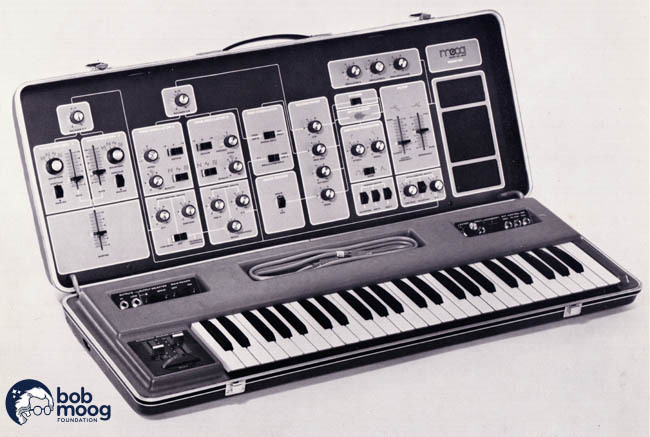 It was activated by a 44-note keyboard.